The A Team Lionettes won the Silver Bracket Championship Friday night at 5 as they defeated Johnson 33-19. Offensive players of the game were Taylor Jenkins and Alyssa Austin with 10 and 7 points, respectively. Defensive players of the game were Peyton Yon for controlling Johnson's guards at the top of our defense and Lauren Omholt for her quick close outs and rebounding. These girls also defeated Cockrill Thursday night by a score of 33-15 to earn a championship game berth. Lauren Omholt and Taylor Jenkins paved the way offensively with 10 and 8 points, respectively. All team members played great defense! The Gold girls’ 7th grade team played Faubion in their district tournament. The girls played their hearts out until the end. The score was a back and forth game the whole game. It came down to the last possession. In the end, Faubion won 28-27. We can’t be more proud of the way the girls played! This was their best game all season by far!! Great season ladies!!! Players of the game were Emily Barnhill and Gia Gall for offense. Defensively the players of the game were Amory Dudek and Savanna Luther!! Dowell 7th Grade girls’ Blue Team played Reynolds in their tournament. This game was back and forth for the whole game until the 4th quarter. Reynolds pulled out to lead, Dowell tried to come back. In the end, Reynolds got the victory. The final score was 11-21. Way to fight until the end girls! We are so proud of your heart and growth throughout the whole season!! Players of the game were Kate Miller and Jazzlyn Hall. The Dowell 7th grade girls’ White Team played Evans in their tournament. Evans jumped to an early lead. Dowell would fight back and pull it to a close game. But in the end, Evans would win 11-19. Dowell played a good game defensively. They just couldn’t get their shots to fall! Players of the game were Nia Dillard and Megan Rowe. We have enjoyed coaching you girls this year!! You have gotten so much better throughout this year!!! We are proud of you. ​The morning began with the B Team Lionettes facing off against Evans in the Silver Bracket. The Lionettes had trouble getting shots to fall as they fell to Evans 18-29 to end their season. Mallory Hugghins was offensive player of the game with 5 points. Jayde Joseph was defensive player of the game. The C Team faced Highland Park in the semifinal of the Gold Bracket losing to the eventual tournament champion. We are proud of how hard the girls played against HP only down by 6 at half time against full court pressure the entire game. Maeve Radley led the Lionettes offensively with 4 points. Emma McCann was the Defensive player of the game. The Dowell Lionettes B Team led at the half 9-3, and 11-9 to begin the 4th quarter. Midway through the 4th quarter, Cockrill took the lead. Dowell would tie the game at 13-13 but Cockrill made Free Throws to move ahead for good. Offensive players of the game were Maggie Maple and Mallory Hugghins. Defensive player of the game was Jayde Joseph. The B team will compete this weekend in the Silver Bracket of the District Tournament this weekend at Dowell. The A Team took revenge of an earlier loss to Cockrill at the beginning of the season by winning 16-12. The combination of mixed defenses kept Cockrill off balance offensively all night. Offensive player of the game was Rylie Rogers. Defensive players of the game were Taylor Jenkins with lot of deflections, and the combination of Lauren Omholt and Nadya Laynor for slowing down the Cockrill point guard. The C Team dominated Cockrill again with a 18-7 win. Offensive player of the game was Quay Mathis and Defensive player of the game was Taylor Stitt. The C Team will play in the Gold Bracket of the District Tournament this weekend at Dowell, finishing with the best season record of all Dowell girls’ basketball teams. The 7th grade girls' Gold Team played Cockrill Thursday night. This game stayed close all game. Cockrill took an early lead, but Dowell kept it close. Dowell out shot Cockrill for the whole game, but couldn't get them to fall. The girls played their best game in awhile. They played great defense and moved around the ball great, but just couldn't pull out the victory. The final score was 32-19. Players of the game were Amory Dudek and Gia Gill. Good game girls!! The Blue Team also played Cockrill Thursday night. This was a well played game by Dowell. They fought hard the whole game. Cockrill pulled out a lead in the 2nd quarter and never looked back. Dowell kept it close though with good defense. They took some great shots, but they just didn't go in. Good game girls!! Your hustle and heart really shown throughout. The final score was 14-26. Players of the game were Lary Rodriquez and Allie Stephenson. The White Team played Cockrill Thursday tonight. This game was all about defense. Both teams played great defense. Dowell played so hard and never gave up. Cockrill jumped out to quick lead. Which they never gave up. Dowel kept it close with good defense. It just wasn't their night shooting. The final score was 7-16. Good game girls!! Keep up the great work!! Players of the game were Nia Dillard and Ripley Cantrell! Summary Details: A team played a tough game vs Cockrill. The score was close the whole game. In the 4th quarter, Cockrill takes the lead with less than 2 minutes left in the game. With a great defensive effort, however, Dowell Lions were able to regain the lead with a layup by Byron Burrell and 2 free-throws scored by Joseph Hansen to win the night 37 to 34. Defensively, everyone played outstanding. The offensive player of the game was Byron Burrell with 14 points. Excellent game overall! Go Lions! Summary Details: B team played an outstanding game taking the lead early. They played tough defense the whole game holding Cockrill to only 5 points in the 1st half. Offensively they moved the ball demonstrating great teamwork. The offensive player of the game was Carson Burden who scored 7 points. Great game for the B team! Summary Details: The 8th Grade C Team played Cockrill Middle School at home Monday night. The Cowboys would take an early lead over the Lions but the Lions would come storming back in the 3rd Period and make it close. Cockrill would take a 2 point and Dowell was forced to send the Cowboys to the free throw line. The Dowell Lions would end up falling to Cockrill 27 - 31. Players of the game were Asher Bates with 5 points and Jake Park with 4 points. Graham Harned would walk with several rebounds and several blocks on the night. Summary Details: The Dowell Lions played their best against the Cockrill Cowboys on Monday night at home. The Lions kept close it in the 1st half but in the 2nd half the Cowboys went on a run 13 - 2 and they never looked back. The players of the game were Ethan McCally with 14 points and Leo Schultz with 8 points. Andrew Dawson and Branden Engwer played outstanding defense with several steals and rebounds. Summary Details: The Dowell Lions played their hearts out against the Cockrill Cowboys on Monday night at home. The Lions kept close it in the 1st half but in the 2nd half the Cowboys went on a run 12 - 0 and they never looked back. Players of the were RJ Howard with 7 points and Jason Reading with 4 points. Garrett Hartman played outstanding defense with several stops and rebounds. The B Team kicked off the night with a 14-13 win over Evans on the road. Mallory Hugghins led the way offensively for the Lionettes with 7 points. The defensive player of the game was Allyson Burgess. The A Team lost to a very talented Evans team. Offensive player of the game for the Lionettes was Taylor Jenkins. Defensive player of the game was Vanessa Masamba with several steals. The C Team had a big win defeating Evans 33-5. Offensive player of the game was Mahogany Bey with 8 points. Defensive player of the game was Emely Rodriguez. Next week, the 8th grade will play Cockrill at McKinney Boyd High School on Thursday, February 7th. 7th grade girls Gold team played Evans Thursday night. The girls played really hard keeping close for most of the first half. Evans pulled away in the 2nd quarter to a lead. The Lionettes came out and played really well in the 3rd quarter. Only allowing Evans to score 2 points that whole quarter. During that quarter, Dowell couldn't get their shots to fall. The final score was 18-41. We love your fight to end girls. Keep it up!! Players of the game were Gia Gill and Savanna Luther. The 7th grade girls Blue Team played Evans Thursday night. These fought hard, but just couldn't get the ball to fall. They played good defense, but just couldn't score. Evans took an early lead and never looked back. Dowell showed great heart until the end. The final score was 9-37. Players of the game were Kate Miller and Afton Christie. The White team played a great game from start to finish against Evans last night. During the whole game, the 2 teams trade buckets. Until Dowell took a 5 point lead late into the 4th period. Evans cut the lead to 1, but Dowell would not let them take the lead. The final score was 17-16. Dowell got the win. Way to play hard on defense and offense the whole game. Players of the game were Alison Smith and Gaby Hill. Summary Details: The Dowell Lions did their best against the Lions Panthers on Monday night. The Panthers defense would ultimately be too much for the lions as they would fall 7 - 45 The players of the game were Huston Piner with 4 points and Asher Mathew Bonin with 3 points. Defensive player of the game was Mitchell Wines with 2 blocks and 4 rebounds on the night. Summary Details: The Dowell Lions played their hearts out against the Evans Panthers on Monday night. The Panthers would jump out to an early lead in the 1st half but in the 2nd half the Lions would break into the Evans with trading bucket for bucket. Mandell Blake was player of the game with 4 points. Summary Details: The A Team played Evans Middle School away Monday night. Lions had an excellent defensive game and kept the game close with some outstanding 3 three pointers from Peyton. In the third period Evans would go on 0 - 10 run and seal the deal took a 2 point lead and would stay ahead. Ethan McCally played an outstanding game and scored 11 points and the defensive players of the game were Sheldon King and Braden Engwer with key rebounds and several outstanding blocks respectfully. Summary Details: A team played an excellent game, demonstrating maturity and high IQ for the game. They moved the ball effectively and selflessly to generate points. Defensively, they were able create over 20 steals and covert to points. Leading scorers were Ben Podor 15 points, Joseph Hansen with 14 points, Mason Saad with 13 points, and Asher Laynor with 10 points. Overall, everyone contributed with assists and defensive communication to help out. Great game throughout. Summary Details: B team played excellent team basketball! Defensively, they amassed over 15 steals. Cole Smith had 11 rebounds and Matthew Obregoso with 6 steals and 8 points. Carson Burden also scored 8 points. Collectively, nonetheless, they had great team effort moving the ball efficiently and communicating on defense. Great game overall. The Dowell Lionettes B Team lost to Highland Park last night on the road. Offensive Player of the game was Sydney Allan and Defensive Player of the game was Allyson Burgess. The Dowell Lionettes A Team had a great first half against Highland Park but then HP exploded offensively second half to run away with the win. Offensive Player of the game was Lauren Omholt and Defensive Player of the game was Peyton Yon. The Dowell Lionettes C Team lost to Highland Park last night but battled fiercely. Offensively Player of the game was Mariya Walker and Defensive Player of the game was Jannie Velasquez. Dowell Gold Team Lionettes played a good HP basketball team. The girls played really hard and kept the game close for half. But in the 3rd quarter, HP made their shots, but the Lionettes' shot just wouldn't fall. So HP pulled out to a bigger lead. The final score was 13-41. We are proud of how the girls never gave up. Keep working hard girls. Players of the game were Amory Dudek and Emily Barnhill. The Blue Team played HP. Their shots weren't falling and the ball wasn't bouncing their way. But they fought hard on defense until the end. The girls had spurts when they didn't allow HP to score. The final score was 3-40. Keeping working hard girls and playing until the end. Players of the game were Allie Stephenson and Kate Miller. The White Team played HP. This was close until HP pulled their lead to double digits in the 3rd quarter and never looked back. The girls' defense was really good tonight. They hustled and never gave up. The final score was 10-27. Keeping working hard on defense and practicing, and the shots will start to fall. Players of the game were Kendall Harrison Nia Dillard. Summary Details: The Dowell Lions A Team played Highland Park Middle School away Monday night. Dowell would take a quick lead on three from Ethan McCally but the Raiders would go on a 18 - 3 and put the game out reach for the Lions. Players of the game for Dowell were Ethan McCally with 5 points and Peyton Tallo with 5 points. Defensive player of the game was Andrew Dawson with 5 rebounds on the night. Summary Details: The Dowell Lions B Team played Highland Park Raiders away Monday night. The Lions would fall behind early in the game but they would put some life back into the game with a spirited effort in the 3rd period closing with 12. However, the Raiders would steal the night and the Lions would fall 19 - 52. The players of the game were Zakeree Blevins with 6 points and RJ Howard with 4 points. Summary Details: The Dowell Lions did their best against the Highland Park on Monday night. The Raiders defense would ultimately be too much for the lions as they would fall 7 - 45 The players of the game were Huston Piner with 2 points and Asher Bates with 3 points. Defensive player of the game was Mitchell Wines with 2 blocks and 4 rebounds on the night. Summary Details: B team played a great game last night. The defensive effort was intense from the beginning to the end. They showed us again this week that they can compete against anyone in the district. We're constantly improving and hoping to see them again in a few weeks at the tournament. Summary Details: A team played a highly competitive game last night. Dowell Lions kept the lead the whole game, yet Highland Park made a comeback the two minutes left to tie the game. Vinny Armelino and Byron Burell scored two big points each close the game with a victory. The whole team played ferocious defense the from begining to end. Our leading scorer was Byron Burrell with 14 points, and Hudson Boring with 6, Colby Farmer with 6, Mason Saad with 6, Vinny Armelino with 5, Ben Podor with 4 and Joe Hansen with 3. B Team lost 8 - 38 as Peyton Miller was the offensive player of the game. Allyson Burgess and Jayde Joseph were the defensive players of the game. A Team lost 13 - 36 after a great start holding a much taller Rogers team to only 4 points in the first quarter. Offensive player of the game was Taylor Jenkins and Defensive players of the game were Peyton Yon and Alyssa Austin. C Team lost 6 - 26 to a tough Rogers squad. The offensive player of the game was Sadie Thode and the defensive player of the game was Mahogany Bey. The Lionettes Gold Team played a great 1st quarter against Rogers. They kept the game close. But in the 2nd quarter Rogers pulled away and never looked back. The girls kept hustling the whole game and never gave up. Even when their shots just wouldn’t fall!! Keep working hard ladies!! Final score was 8-51. Players of the game were Kali Vanderhoof and Savannah Luther. The Lionettes Blue Team played Rogers last night. They fought hard the whole game!! Keeping it close until the 4th quarter with great defense. Keep up the good work! Final score was 6-25. Players of the game are Alyssa Richard and Kate Miller. The Lionettes White Team played Rogers tonight. They played a hard game. Their defense was really good tonight, but they just couldn't get their shots to fall. The score was close for pretty much the whole first half. Rogers came out shooting lights out in the 3rd and pulled away from the Lionettes. Dowell never gave up and fought until the end. Final score was 7-30. Players of the game were Megan Rowe and Andrea Garcia. Summary Details: B team played an intensely contested game. In the first quarter they were down 18 to 3 only to tie the game before the end of the half. Great team effort overall. Our top scorers were Carson Burden with 5, Cameron Phillips with 6, and Caden Glenn with 11. Summary Details: A team played at great game against Rogers. Considering the disadvantages, facing a bigger team, they played hard defense and excellent teamwork on the offensive side. Our highest scores were Asher Laynor with 5, Vinny Armelino with 6, Byron Burrell with 7, and Ben Podor with 8. Summary Details: The 8th Grade C Team played Rogers Middle School at home Monday night. The Rogers Eagles would take an early lead over Dowell and keep at a distance until the 4 period. Dowell would then make it close and would have several opportunities late to cut the lead. The Dowell Lions would end up falling to Rogers 23 - 29. Players of the game were Huston Piner with 9 points and Wyatt Huggins with 4 points. Defensive player of game of was Jake Park with several steals and defensive stops on the night. Summary Details: The Dowell Lions A Team played their hearts out against the Rogers Eagles on Monday night. The Lions kept close it in the 1st period but late in the 1st half the Eagles would go on a run 24 - 4 and they never looked back. Peyton Tallo and Ethan McCally did an excellent of job running the offense and Sheldon King played great defense with several steals and stops. The player of the game was Ethan McCally who would score 12 points on the night. Summary Details: The Dowell Lions played the Rogers Middle School Monday night at home. The game would be a game of offensive spurts from either team and come down to free throws in a close game in the end. In the end, the Lions would fall short to the Eagles. The players of game were RJ Howard with 14 points and Zakeree Blevins with 11 points. The B Team began the night with a 12-5 win over Johnson. Offensive player of the game was Jayde Joseph with 6 points. Defensive player of the game was Neveah Moncrief with several deflections and steals. The A Team led the entire game but Johnson did not quit fighting back. Dowell Lionettes A Team won a close one 34-32. Offensive player of the game was Taylor Jenkins with 12 points. Defensive players of the game were Nadya Laynor and Alyssa Austin. The C Team ended the night with a 32-15 win over Johnson. Leading scorers and offensive players of the game were Taylor Stitt and Quay Mathis with 6 points apiece. Defensive player of the game was Ayleen Avila. The Gold team played their hearts out Thursday night. They played a very good Scott Johnson team. The score doesn't show how much they tried the whole game. They got off to a slow start, but settled down during the game. Their shots just weren't falling tonight. The final score was 13-59 with Scott Johnson winning. We are proud of how they kept fighting the whole game. Players of the game were Emily Barnhill and Melanie Kates. The Blue team played a good game Thursday night, but just couldn't pull out the win in the end. Dowell would a get a lead, but Scott Johnson would come back to tie the score. In the fourth quarter, Scott Johnson took the lead, and wouldn't let it go. The final score was 15-18. Keep improving girls. Players of the game were Kate Miller and Leriany Rodriguez. The White Team got their first win Thursday night. They played the best game of the season. As a team, they played great defense, shot and passed the ball well. Dowell started fast and never looked back. The final score was 24-8. Great Job girls! Players of the game were Emily Batista, Megan Rowe, and Nia Dillard. Summary Details: The 8th Grade C Team played Scott Johnson Tigers at home Monday night. The Dowell Lions would take an early lead over Scott Johnson Middle and never look back. The Lions dominate all aspects of the game win in convincing fashion 29 -13 over the Tigers. The Dowell Lions Players of the game were Hutson Piner with 6 points and Robert Zapata with 6 points. Defesive players of the game were Asher Bates Jake Park both would walk with several steals on the night. Summary Details: The Dowell Lions A Team played Scott Johnson Tigers at home Wednesday night. Lions had an excellent defensive game and kept close with some outstanding 3 three pointers from Ethan McCally and Peyton Tallo. The Tigers sent the Lions to line were ultimately the game was decided. Sheldon King and Ethan McCally played an outstanding game and scored 11 point and 13 points perspectively. The defensive players of the game were Andrew Dawson and Braden Engwer with key rebounds and several outstanding blocks. Summary Details: The Dowell Lions B Team played Scott Johnson Middle School and struggled early in the 1st half and were down by 3 points. In the second half the lions came storming back walked away with a 26 - 16 lions win. Players of the game were Charlie Sipka with 5 points and R.J. Howard with 6 points. Defensive standouts were Jason Reding and Zakerre Blevins who both great blocks and steals. 3 wins for 7th grade basketball. B team had a great start to the game with everybody playing ferocious defense getting several steals and making defensive stops. The leading scorers were Brayden Whitfield and Kaden Glenn with 10 points each. Carson Burden scored 8 points. Cole Smith and Cameron Smith contributed with several assists, rebounds, and steals to help us win the game. The Dowell 8th girls’ C Team defeated Faubion last night by a score of 24-19. Offensive player of the game was Quay Mathis and Defensive player of the game was Maeve Radley. The A Team lost 16-21 in a great battle. Offensive player of the game was Vanessa Masamba and Defensive player of the game was Whitney Afungo with several blocked shots and rebounds. The B Team lost 15-23. Offensive player of the game was Lauren Blatt and Defensive player of the game was Janie Gantt. ​Dowell's 7th grade girls' Gold Team played a hard fought game against Faubion. They played 4 people down. The girls never gave up or quit the whole game. During the first half, the girls kept it close. But in the 2nd half they just ran out steam and Faubion pulled away. At one time Dowell only had 4 girls on the court. The final score was 14-36. Players of the game were Gia Gall, Kali Vanderhoof, and Melanie Cates. I am proud of all the girls in how they fought the whole game. Dowell's 7th grade girls' Blue Team is getting better each week. They are playing like a team and with more confidence. Last night they played Faubion, and fought again the whole night. They kept it close for the first half, but Faubion pulled away in the 2nd half. Dowell got the shots they wanted, but just couldn't get them to fall. The final score was 8-27. We love how they are getting better. Keep working hard ladies. Players of the game were Leriany Rodriguez, Kennedy Tilley, and Kate Miller. Dowell's 7th grade girls White Team played another good game tonight. They keep working hard in practice, and it shows on the court. They played Faubion last night, and just couldn't hit their shots. All game they played great defense. In the 4th quarter, they made a run and brought the game to a 5 point lead for Faubion. But Faubion would make some baskets to extend their lead back to 9. Where they would win 8-17. Keep working hard ladies!!! Players of the game were Juji Rivera, Alison Smith, and Gaby Hill. Summary Details: The 8th Grade C Team played Faubian Middle School at home Monday night. The Dowell Lions would take an early lead over Faubain and keep it until late 4th period. Faubian would take a 2 point and Dowell was forced to send the other Lions to the free throw line. The Dowell Lions would end up falling to Faubian 31 - 33. Players of the game were Asher Bates with 8 points and Graham Harned would walk with several rebounds and block on the night. Summary Details: The 8th Grade Boys A Team Dowell Lions played Faubian Middle School at home Monday night. The Dowell Lions would play lights out in the 1st half and be only down by 4 points had half-time. Faubian would pull away in the 3rd Period and go on a 19 - 8 run. The Lions would ultimately fall to Faubian 70 - 54. The players of the game were Ethan McCally and Peyton Tallo with both 17 points on the night. Summary Details: The Dowell Lions B Team played Faubian Middle School at home Monday night. Dowell would give all they had in the 1st half and would be down 17 - 20 but Faubian would go on a 15 - 3 and put the game out reach for the Lions. Players of the game for Dowell were Mandel Blake with 8 points and Zakare Blevins with 9 points. Summary Details: A team played an outstanding game verse Faubian. Everyone scored. Our highest scorer for this game was Ke'Maur Johnson with 12 points. Ever Brown and Byron Burrell scored 10 points each. Joe Hansen scored 9 points, Mason Saad scored 7, Colby Farmer scored 6, and Asher Laynor scored 4. Ben Podor, Hudson Boring, and Vinny Armelino each scored and had several defensive stops each. Great victory for the A team to end the year. Summary Details: B Team played an excellent game scored 36 points collective. They played great defense holding Faubian to only 14 points total. Cole Smith score the most points with 10 and Matthew Obregoso scored 8 points. Carson Burden scored 5, and Caden Glenn and TJ Holmes scored 4 points a piece. Excellent display of team work by the whole team. Summary Details: The Dowell Lions A Team played their hearts out against the Frisco's Griffin Middle School at A Team Hoop Fest Tournament. Griffin would start the game with a 18 - 2 run and would never look back. Peyton Tallo and Ethan McCally did an excellent of job running the offense. The player of the game was Leo Schultz who would score 6 points on the night and Andrew Dawson was the defensive player with 4 steals and 6 rebounds on the night. The A Team played Frisco Clark Middle School at the Hoop Fest Tournament held at Dowell Middle School Saturday morning . Lions had an excellent defensive game and kept the game close with some outstanding 3 three pointers from Peyton. In the forth period Clark took a 2 point lead and would stay ahead. The Lions sent Clark to line were ultimately the game was decided. Andrew Dawson and Peyton Tallo played an outstanding game and each scored 6 points and the defensive players of the game were Peter Broas and Braden Engwer with key rebounds and several outstanding blocks respectfully. The Lionette 8th Grade B Team narrowly lost to Prosper Reynolds 18-20 last night. Offensive players of the game were Jayde Joseph and Hailey Millwee. Defensive player of the game was Maggie Maple. Lionette 8th Grade A Team stayed close to Prosper Reynolds for a half only down 1. Reynolds won 36-20 as the Lionette Offensive player of the game was Lauren Omholt. Defensive players of the game were Nadya Laynor and Lauren Omholt. The C Team Lionettes also barely lost to Reynolds 16-18. Maeve (pronounced Mave) Radley was the Offensive Player of the game while Ayleen Avila earned Defensive Player of the game honors. The A Team Lionettes begin the Hoopfest today in Allen at Ereckson Middle School. Good Luck ladies! 7th Grade Girls Gold Team - The girls played really hard tonight through the whole game against Prosper Reynolds. It was a close game the whole game. The advantage would go back and forth all night long. This was until Dowell pulled out to a 6 point lead in the 4th quarter, and never looked back. The final score was 26-22. Leading scorers were Gia Gall and Emily Barnhill with 11. Good defenders tonight were Melanie Cates and Savanna Luther. 7th grade girls Blue Team - The Blue team played Reynolds before and lost, but this time they kept it close until the end. Where Reynolds scored 2 buckets to extend their lead late. Dowell was ahead at halftime. The girls played a great game with much progress this week. But in the end Reynolds won 6-21. Players of the game were Leriany Rodriguez, Kate Miller, and Alyssa Richard because of their great defense. 7th grade girls White Team - The White Team played their hearts out and never quit. Reynolds played really well and was able to make their baskets tonight. Lionettes had their shots, but just couldn't get them to fall. They played with great heart tonight and with much progress from last week. The final score was 2-30. Players of the game were Riley Rogers, Nia Dillard, and Brooke Biggerstaff for their good defense and some good passes. This was an intense game from the beginning. Lions were down 19 to 8 at the half. In the third quarter we had some big isolation plays from Cameron Phillips and Terrence Holmes to put right back in the game with 9 points each. Collectively the defensive was awesome. Matthew Obregoso, Cole Smith, Carson Burden and Jaxon Monden made big defensive stops to keep us alive late in the game. Great game overall! The Dowell Lions A Team played their hearts out against the Reynolds Eagles on Monday night. The Lions kept close it in the 1st period but late in the 1st half the Eagles would go on a run 24 - 4 and they never looked back. Peyton Tallo and Ethan McCally did an excellent of job running the offense and Sheldon King played great defense with several steals and stops. The player of the game was Peter Broas who would score 9 points on the night. The Dowell Lions did their best against the Reynolds Eagles on Monday night. The Lions played great both defensively and offensively in the 1st half and kept it close with a score of 11 - 16 at the half. In the 2nd half, the Eagles's defense would ultimately be too much for the lions as they would fall 16 - 32. The players of the game were Logan Schindler and Graham Harned, who both scored 7 points on the night. Asher Bates and Hutson Piner did an excellent of job of running the offense and playing great defense. The Dowell Lions played their hearts out against the Reynolds Eagles on Monday night. The Lions were outscored in the 1st half 22 - 8 but in the 2nd half the Dowell Lions' defense came alive and held the Eagles to only 2 points. The 1st half would be too much to much to over come and Lions would fall 17 - 24 to the Eagles. The player of the game was Zakare Blevins who had 9 points and with several rebounds on the night. Dowell Lions played Prosper Reynolds at 9:00 am in the first round of the tournament. The game was very close from the opening. The lead changed throughout the game. In the fourth quarter, Reynolds was leading by four points. Dowell Lions made a comeback taking the lead winning 24-23. Obregoso had a big defensive game with several steals also making some key free-throws to get us the lead at the end of the game. Cole Smith, Carson Burden, Andrew Johnson, and Cameron Phillips contributed defensively and offensively to bring us back to get win in a heated contest against Prosper Rogers. Dowell 33 Denton Nova 44 Dowell Lions played a tough but great game against Denton Nova. Nova took a big lead early, however, in the second half Lions cut the lead to 6. We had big contributions from Carson Burden, Cameron Phillips, and Cole smith the whole game. Terrence Holmes and Brayden Whitfield came off the bench to make some big shots to keep us in the game. We played hard the whole game however came up short. Dowell 46 Fabian 29 Dowell lions played a great game against Faubian. Everyone contributed for a dominant win. Ja'Tavious Greer, Andrew Johnson, and Jaxson Monden made big defensive plays. Cole Smith, Cameron Philips, Brayden Whitfield, Matthew Obregoso, Kaden Glenn, and TJ Holmes all scored giving us a decisive win over Faubian. Saturday, December 8, 2018 the 8th Grade Basketball Lionettes B Team competed at Cockrill in a Tournament. After leading for 3 ½ quarters, we suffered a heartbreaking loss to Prosper Reynolds 16-20 in Game 1 Game 2 Highland Park ran away with the win 23-4. Offensive players of the day for Dowell were Cayla Dailey, Mallory Hugghins with 4 points apiece and Maggie Maple hit a big 3 vs. Highland Park. Defensive players of the day were Hailey Millwee, Grayson Abcarian and Peyton Miller! Saturday, December 8, 2018 the 7th Grade Basketball Lionettes B Team competed at Faubion in the MISD Invitational Tournament. We fell to Prosper Reynolds 39-11 in Game 1. Game 2 Highland Park also defeated the Lionettes 36-12. Offensive players of the day for Dowell were Alyssa Richard, Leriany Rodriguez and Izzy Adame. Defensive players of the day were Kate Miller, Allie Stephenson and Kennedy Tilley. Thursday, December 6, the 7th grade Dowell Lionette basketball teams faced off against a very skilled Cockrill squad in their season opener. The ladies worked hard, and fought to the end, but walked away 0-3 for the night. The Blue squad finished the night with a score of 11-25. Izzy Adame scored 2 points and hustled hard on defense resulting in 4 steals. Kate Miller put up 4 points off two offensive rebounds and had 1 great block on defense. The Gold squad played a very aggressive game but fell to Cockrill 40-26. Savanna Luther took some hard hits on offense but still came away with 6 points. Emily Barnhill put up 10 points for her team, including a beautiful 3 pointer assisted by Melanie Cates on a tricky inbounds play. Cates also did an awesome job on defense forcing 3 turnovers. The White squad lost with a score of 17-7. Andrea Garcia and Juji RIvera hustled from end to end, forcing multiple turnovers from Cockrill. Brooke Biggerstaff put up two points and ran a great offense. She stepped into the guard position for the first time tonight and made her coaches and team very proud! All three teams showed a lot of hustle and heart. They will be ready to take the W when they meet Cockrill again at the end of the season! The 7th Grade B team will play Saturday at Faubion in a tournament. Good luck ladies! Dowell Lionettes 8th grade squads traveled to Cockrill Thursday night and came away with 2 wins. Jayde Joseph, Neveah Moncrief, Mallory Hugghins, and Jannie Gantt led the B team with very balanced scoring with 4 points apiece. Grayson Abcarian and Hailey Millwee teamed up to pester the Cowgirls for several steals! The B team defeated Cockrill 19-12. The C team scored 27 points to Cockrill’s 14 and ran away with the win. Jayden Pena and Quay Mathis led the Lionettes with 9 and 8 points, respectively. Our A team played a very hard fought physical battle but fell to Cockrill 17-27. Lauren Omholt led the way with 5 points, 6 steals, and several deflections. Taylor Jenkins chipped in 4 points to help the cause. The 8th Grade B team will play Saturday at Cockrill in a tournament. Good luck ladies! continue this week with 7th Grade Girls 6:45 - 9:00 a.m. & 8th Grade Girls from 3:00 - 5:15 p.m.
B, A, C order beginning at 5 p.m.
7th @ Faubion, DMS Team report @ 7:30 a.m.
8th @ Cockrill, DMS Team report @ 7:30 a.m. Both Teams will begin play @ 8:00 a.m.
Dowell Lionettes 8th Grade preview goes well...to be continued!!!!!!!!!!!!!!!!!!! Basketball try outs are HERE!!!! All athletes trying out need to have a signed letter/contract on file with Coach Zapata BEFORE MONDAY morning. tomorrow is the last day to turn letter into him. if they do not have the letter then they will not be able to try out. Athletes MUST be passing ALL classes and UIL eligible to try out. Make up day for any day missed due to illness is FRIDAY Nov. 16th starting at 6:45 - 8:00 for BOTH 7th & 8th graders. Tryouts are from Nov. 12 - 15. ​Make up date is Nov. 16th at 6:45am - 8:00am for both grades !!! The 7th and 8th grade makeup will be Friday, November 16th from 6:30 am- 7:30 am. This is only for students that missed due to illness with a doctor’s note. After tryouts, 7th Grade practices will be from 6:45-9:10 a.m. (boys and girls) daily while 8th Grade practices (boys and girls) will be from 3:10-5:15 p.m. daily. * In order to tryout, all student athletes MUST have the following on file with the coaches: a current physical & a signed tryout information agreement. * Players will be assigned a number during tryouts. The girls will wear tryout jerseys with that number. * Players must attend all tryout sessions to receive the opportunity to achieve the maximum score allowed. * Athletes should notify a coach either in person, by phone, or by e-mail of any absence. 469-302-6700. * Any unexcused absences will result in athletes not being allowed to make up the try-out for that day. * Excused absences are an illness or family emergency with coaches’ notification. * Players are expected to be on the court on time for tryouts. Two tardies are equal to one unexcused absence. * Players MUST BE ACADEMICALLY ELIGIBLE to participate in tryouts. * Tryout sessions are closed to everyone other than athletes and coaches. * Players will receive a letter on Friday, November 16th communicating whether or not the student athlete made the team. These letters will be handed out after school, and student athletes will be asked not to open them until they get home. A schedule can be found @ www.rankonesport.com for your review. I have also given a hard copy schedule to each athlete that is trying out. Please review the schedule to ensure you don’t have any conflicts with games. We expect all team members to participate in every game and tournament scheduled. If a practiced is missed, it must be made up. A penalty sit-out game will be assessed for missing games/tournaments for outside activities. In the final district game of the season, the Dowell Lionettes faced a fierce opponents in the Prosper Rogers Lady Eagles. Starting off the night, the blue team put up a fight but fell short with a 7-24 loss to Rogers. Alanna Copado scored 2 points for the Lionettes, along with 2 rebounds and 1 steal for the night. Also scoring for Dowell was Nathanim Kidane with 2 points. Taylor Dowling made a bucket giving her 2 points and 1 rebound against the Lady Eagles. Good luck in the tournament this weekend Blue team! In the second game of the night, the Lionettes hustled up and down the court, scoring point for point with the Lady Eagles until the final quarter when Rogers won 43-29. Lead scorer was Faith Horton with 10 points, 1 assist, and 3 rebounds. Natalee Rogers swished 2 three’s and had 1 rebound. Gracie Branson scored 4 points for the Lionettes, as well as 1 assist and 3 rebounds. Jacie Schussler also scored 4 points and had 2 steals for the night. Vanessa Mejia added another 2 points to the score and had 2 beautiful assists and 1 rebound. Aariyahna Suggs also scored a 3 for the Lionettes. Keep working towards your goal for next week’s tournament Gold team! In the final game of the night, an exciting match-up between the Lionettes White team and Rogers. The Lionettes hustled hard for all four quarter, just falling short of the victory in the last seconds of the game with a 15-20 loss to the Lady Eagles. Lead scorer of the night was Kyra Jones with 4 points and 2 rebounds. Amy Santimaw, Kaylee Sutton, Bianca Diaz, Sydnie MacAllister, and Rylie Hostetter all scored 2 points each for the Lionettes. Talk about team work! Cailin Bell and Katie Crawford also added 2 steals for the team. Crawford also scored a free throw and had 3 rebounds for the night. Good luck in your tournament this weekend White team. The Blue and White teams will play this Saturday, February 10, in the district tournament at Faubion Middle School. Gold team will play next Saturday, February 17, in their district tournament at Evans Middle School. The Dowell Lionettes 7th Grade Girls’ Basketball team played hard but lost 3 games to Prosper Rogers last night. The Blue “B” team lost their game 4-40. Mallory Hugghins scored 2 points, had 3 rebounds, and 1 block. Jayde Joseph also scored 2 points, had 3 rebounds and 2 steals. Cayla Dailey had 2 rebounds and 2 steals. The Gold “A” team lost 17-44 after a rough 2nd quarter. They fought hard in the 2nd half though only losing it, 13-16. Janie Gantt led the team with 4 points and added 2 rebounds defensively. Taylor Jenkins had a beautiful 3 pointer and 2 steals. Whitney Abboud had 2 points, 2 blocks and 3 rebounds. ​he Blue and White teams will have their district tournaments this Saturday at Evans Middle School. In the last home game of the season, the Lionettes faced Faubion Middle School in three fast-paced games. In the first game of the night, the Blue team played their hearts out but ended with a 13-16 loss. In her first game back, Noel Sedgwick was the leading scorer with 5 points, 1 assist, 1 block, 2 rebounds, and 2 steals. Also scoring 2 points each for the Lionettes was Audrey Sperry and Paula Aisosa. Alanna Copado scored 4 points, had 1 rebound, and 2 steals. The Lionettes battled Faubion to the last seconds of the game, we are very proud of their efforts on the court. In the Gold team’s game, the Lionettes outscored the Faubion Lady Lions in every quarter with a 41-15 win. Kylie Campbell scored a 3 pointer and an outside shot, for a total of 5 points, along with 1 block, and 2 rebounds. Natalee Rogers also scored a three, giving her 6 total points for the game, along with a block. Kaylin Perry scored 6 points for the Lionettes and had 2 rebounds. Lead scorer for the Gold team was Faith Horton 15 points. Way to push through and remain focused throughout the game Lionettes. In the final game of the night, the White team won an exciting game over the Faubion Lions with a final score of 20-7. Amy Santimaw, Cailin Bell, and Rylie Hostetter all scored 4 points for the Dowell Lionettes. Kaylee Sutton scored the first 2 points of the game, along with 1 rebound and 1 steal. Bianca Diaz, Katie Crawford, and Charlize Bartholomew also all scored 2 points for the White team. Crawford added 1 rebound and a steal, while Diaz contributed 6 rebounds and 3 steals for the Lionettes. Great game White team. Your hard work has paid off! The Lionettes will play their last season game next Thursday at Prosper Rogers. In Thursday nights match up against Prosper Reynolds the Lionettes faced fierce opponents. The Blue team lost in a tough battle of speed and agility. Lead scorer for the Blue team was Kailyn Perry with 9 points, 1 assist, 3 rebounds, and 7 aggressive steals. Also scoring for the Lionettes was Emily Heaton with 5 points, 4 rebounds, and 2 steals. Paula Aisosa added 3 impressive rebounds and 2 steals for the Blue team. Keep hustling hard Blue team! In the second game of the night for the Lionettes, the Gold team started the game looking promising, matching point for point before Reynolds regained control in the second half. Kylie Campbell scored two free throws for the LIonettes, along with a rebound and some aggressive steals. Faith Horton added 9 points for the Lionettes, 2 blocks and 5 rebounds. Aariyahna Suggs scored 5 points, has 1 assist, 2 rebounds, and a steal. Keep fighting Gold team. We love you’re heart! In the final game of the night, the Lionettes fought through and competed with very tough competition. Lead scorer for the White team was Bianca Diaz with 4 points, 2 rebounds, and 2 steals. Kyra Jones had an impressive defensive game with 6 rebounds and 5 steals. Also scoring for the White team was Rylie Thomason with 2 points. Way to play hard throughout the entire game White team! ​The Lionettes face Faubion Middle School next Thursday at Dowell. The Dowell Lionettes 7th Grade Girls’ Basketball team won 1 and fought hard but lost 2 against Prosper Reynolds last Thursday night. The Blue “B” team played won their game 16-5. Lauren Omholt led with 8 points and 5 assists. Both Presleigh Morris and Jessica Green helped out with 4 points each. Mallory Hugghins and Morris also led the team on defense with 8 and 7 rebounds respectively. Way to go Blue! The Gold “A” team played through some tough competition but still lost, 20-40. Taylor Jenkins led the night again with 8 points, 6 rebounds, and 5 steals. Vanessa Masamba added 6 points and 3 rebounds to that total. Alyssa Austin led defensively with 7 rebounds. Great fight to the end! The White “C” team finished the night with a loss 2-23. Maddi Jones scored the 2 points for the Lionettes. While everyone played with all they had, the Eagles had a little more height and a little less illness to come out on top. ​Our next game is on February 1st away against the Faubion Lions starting with the Blue game at 5:00pm. One Heart, One Team, LIONETTES! The Dowell Lionettes faced the Cockrill Cowgirls at Boyd High School in their Thursday evening game. The Blue team lost 10-6 in a hard fought game against Cockrill. Lead scorer for the night was Kailin Perry with 4 points, 1 rebound and 6 aggressive steals. Taylor Dowling also scored 2 points, had 1 rebound, and 2 steals for the blue team. Another strong player of the night was Paula Aisosa with multiple blocks, rebounds, and steals. The Gold team played with their whole hearts in the second match up of the night against the Cowgirls and ended up with a 42-25 loss. Lead scorer of the night was Faith Horton with 11 points. Aariyahna Suggs had 8 points, 1 rebound, and some highly impressive ball handling skills throughout the game. Natalie Rogers added 4 points for the team, 1 rebound, and 1 steal for the night. The White team hustled through a close game and ended with a 14-7 loss. Kyra Jones, Bianca Diaz, and Riley Thomason all scored 2 points for the team. Lead rebounders for the night were Rylee Hostetter and Charlize Bartholomew with 3 rebounds each, while Jones and Diaz each had 5 steals for the Lionettes. The Dowell Lionettes Seventh Grade basketball teams gave a great effort winning on and losing 2 in their games against the Cockrill Cowgirls last night. The Blue “B” team score was 7-12. Jessica Green led the team with 5 points while Imani Abboud contributed 2 points. Defensively, Mallory Huggins had 2 blocks and 2 rebounds. The Gold “A” team lost 23-31. Lauren Omholt worked hard scoring 6 points, with 5 rebounds and 2 steals. Taylor Jenkins also had 6 points with 3 rebounds and 1 steal. Rylie Rogers scored her first 3 pointer as well. The White “C” team played hard and finished with the only win of the night. E’Quavia Mathis scored 2 points, had 2 steals and 6 rebounds. Nadya Laynor had 6 steals and 3 rebounds. Emily Rodriguez scored her first basket and had 1 steal. Maddie Jones had 4 points, 2 steals, and 1 rebound. Everyone did amazing!!! Coach Braddock says this was your best defensive game of the season! ​Our next game is next Thursday, January 25th, AWAY against PROSPER REYNOLDS starting with the Blue Team game at 5:00pm. One Heart, One Team, LIONETTES! In Thursday night’s match up, the Lionettes took on Evans Middle School. In the first game of the night, the Blue team just fell short of the victory with a 12-14 loss. Kailin Perry stood out as a lead player for the night with 2 points, 2 assists, 2 blocks, 6 rebounds, and 7 steals. Another aggressive player for the Blue team was Alanna Copado, who consistently attacked the basket. She ended the night with 2 points, 1 rebound, and multiple steals. Nathanim Kidane added another 2 points and 7 rebounds for the Lionettes. While most players for the Blue team scored, the Lionettes were barely beat in the last seconds of the game. Blue team, we are so proud of your effort in tonight’s game! In the second game of the night, the Gold team took a 24-20 win over Evans. It was a evenly matched game up to the fourth quarter, when the Lionettes solidified their victory. Lead scorer for the night was Faith Horton with 8 points, 1 assist, 1 block, 3 rebounds, and 2 steals. Vanessa Mejia added 4 points, 5 rebounds, and 1 steal to the Lionettes win. Natalee Rogers and Aariyahna Suggs both made impressive 3 point baskets for the Lionettes in crucial moments in the game. Rogers also had 3 rebounds. Suggs added a layup, 1 block, 1 rebound, and 1 steal to her stats for the night. Gold team, we could not be more proud of the way you played as a team tonight! In the final game of the night, the White team ended with a 2-16 loss to Evans. Amy Santimaw made 2 free throws and had 1 block for the Lionettes. Kyra Jones played great defense with 1 block and 1 rebound. Riley Thomason also had an impressive defensive game with 2 rebounds and 2 steals for the Lionettes. White team, we enjoy watching your effort and energy on and off the court. Keep working hard! The Lionettes will face Cockrill Middle School next Thursday at Boyd High School. Good luck to all three teams! The Dowell Lionettes Seventh Grade basketball teams gave a great effort, but lost all 3 in their games against the Evans Panthers last night. The Blue “B” team score was 11-22. Presleigh Morris led the team with 8 points, 4 steals and 5 rebounds. Mallory Hugghins also contributed 3 rebounds to the effort. The Gold “A” team lost 20-33. Lauren Olmholt and Taylor Jenkins led the team with 6 points each while Rylie Rogers added 4. Alyssa Austin and Whitney Afunugo led the team in rebounds with 4 each. The White “C” team finished with a loss, 7-13. Great efforts were given by Sydney Allan and Maggie Maple at the end trying to catch up. ​Our next game is HOME against Faubion starting with the Blue game at 5:00pm. One Heart, One Team, LIONETTES! The Lionettes played Johnson Middle School last night in three tough games. The Blue team came out on top with a 26-11 win. The game was neck and neck throughout the first half until the Lionettes amped up their game to take the lead. Lead scorer for the night was Alanna Copado with 6 points, 1 assist, and 2 rebounds. Kailyn Perry, Taylor Dowling, Allison Lane, and Nathanim Kidane all scored 4 points each for the Lionettes win. Emily Heaton and Ava Montgomery added 2 crucial points each as well as some fantastic defensive plays. Congratulations Blue team. What a great game! In the second game of the night, the Lionettes started out slow but soon found their way back in the lead with a 34-19 win. Lead scorer of the night was Faith Horton with 11 points, including a 3 pointer, 1 assist, 2 rebounds, and 3 steals. Vanessa Mejia, Kaylin Chapin, McKenna Prather, Genevieve Miller, and Gracie Branson all added 2 points for the Lionettes win. Aariyahna Suggs made a beautiful 3 pointer to give her 7 total points for the game, 1 rebound, and 1 steal. Great job Gold team. Way to finish the game! In the final game of the night, the Lionettes played one of the most exciting games yet. With a hard fought battle the entire game, the Lionettes lost in the last few seconds 16-18 to Johnson. Lead scorer was Bianca Diaz with 6 points, 1 block, and 5 rebounds. Katie Crawford, Sofia Levario, and Amy Santimaw all added 2 points for the Lionettes total score. Rylie Hostetter scored 3 points and 3 steals. Way to fight hard to the last second White team. We are so proud of your effort! The Dowell Lionettes 7th Grade Girls’ Basketball team swept by winning all 3 games in their competition against the Scott Johnson Tigers at home last night. So proud of all 3 teams and how well they played even when things got rough. The Blue “B” team played hard and won their game 23-13. Presleigh Morris led the team in scoring with 9 points and defensively added 5 steals. Cailey led the team defensively with 8 steals while Jayde Joseph contributed 6 rebounds. Jessica Green also helped out with 6 points and 4 rebounds. Way to go Blue! The Gold “A” team played through some tough competition and came out on top, 36-35. Taylor Jenkins led the night with 12 points, 6 rebounds, and 6 steals. Lauren Omholt and Alyssa Austin each added 9 points offensively and defensively Omholt had 5 steals and Austin had 5 rebounds. Great fight to the end! The White “C” team finished the night with a win also, 21-7. Peyton Miller led scoring with 8 points and contributed 6 rebounds and 1 block. Sydney Allan added 4 points while Grayson Abcarian added 7 steals and Nadya Laynor added 5 steals. Awesome job ladies! ​Our next game is on January 11th away against the Evans Panthers starting with the Blue game at 5:00pm. One Heart, One Team, LIONETTES! The Lionettes faced the Highland Park Raiders in their Thursday night match up. The blue “B” team fought hard throughout the game, coming up short 12-34 in the end. Scorers for the night were Emily Heaton, Alana Copado, Kailin Perry, Taylor Dowling, Ava Montgomery, and Allison Lane all with 2 points. Talk about a team effort. Lane also added 2 rebounds and 2 steals for the Lionettes. This team continues to grow each week, showing great effort in games and practices! The second game of the night was a head to head match for the Gold “A” team. The Lionettes held the Raiders in a great defensive battle until the last quarter with a 14-39 loss. Lead scorer for the night was Faith Horton with 9 points, 4 rebounds, and 4 steals. Also adding to the Lionettes score was Kaylin Chapin with 4 points and 5 rebounds. Finally, Jacie Schussler made a clutch free throw, 1 assist, and 2 rebounds. This team always shows true heart on the floor, winning or losing. They fight every second that they are out on the court! The last game of the night was the white “C” team, fighting hard throughout the game but finishing with a final score of 7-24. Lead scorer for the white team was Bianca Diaz with 3 points, 4 rebounds, and 1 steal. Amy Santimaw hit a beautiful 3 pointer in the 2nd half, and added 1 block, and 2 rebounds. Also scoring for the white team was Katie Crawford with a free throw opportunity, 2 rebounds, and 2 steals. These girls work hard every time their feet touch the floor. Way to hustle white team! The Lionettes will travel to Johnson Middle School next Thursday. Good luck Lionettes! The Dowell Lionettes 7th Grade Girls’ Basketball team lost 3 games in their competition against the Highland Park at home last night. The Blue “B” team played hard, but lost their game 3-33. Cayla Dailey scored 1 point, and had 5 rebounds. Allison Burgess had 5 rebounds, and Jorryn Echeverria contributed 1 steal. The Gold “A” team (after losing a 4th player to injury in the past week) played their hearts out but still lost 4-53. Rylie Rogers scored 2 points, Janie Gantt had 2 rebounds, Alyssa Austin had 3 rebounds, and Whitney Afunugo scored 2 points and had 3 blocked shots. The White “C” team finished with a loss, 1-30. Maddie Jones scored on a free throw. Peyton Miller had 5 rebounds, while Taylor Stitt had 3 rebounds and 1 steal. Grayson Abcarian led the night with 8 steals. Our next game is on December 21st at home against Scott Johnson starting with the Blue game at 5:00pm. ​One Heart, One Team, LIONETTES! The 8th grade Dowell Lionettes played Prosper Rogers last night. While the Blue team came out with the only win for the night, the Gold and White teams fought hard in close games. The Blue “B” team won a close game with a score of 16-15. The Lionettes fought back from a deficit until the 3rd quarter, where they took control of the game. Dowell and Rogers fought out the rest of the game. Lead scorer for the Blue team was Emily Heaton with 5 points, 1 assist, and 4 steals. Nathanim Kidane scored 4 points to add to the Lionette’s win and had 1 rebound and 3 steals. Allison Lane worked aggressively for her 3 points, along with Audrey Sperry and Kailyn Perry each with 2 points. Way to fight to the end Blue team! The Gold “A” team lost in a heart wrenching 4th quarter battle 25-30. Faith Horton had an impressive 15 points, 1 assist, and 3 rebounds. Aariyhana Suggs swished a 3 pointer to tie the game in the 4th quarter and 2 rebounds. Gracie Branson fought hard under the basket for 2 points and a block. Keep working hard Gold team! The White “C” team lost a hard fought game 12-19. Lead scorer for the Lionettes was Amy Santimaw with 7 points, 3 rebounds, and a steal. Riley Thomason also scored 2 points for team and a rebound. Kyra Jones played hard and scored 2 points for the Lionettes. These girls continue to grow and grow each week. Way to work tonight White team! The Gold “A” team will play tonight, Friday December 8 at 8pm in the Collin County Hoopfest. Bring home some gold, Gold team! The Dowell Lionettes 7th Grade Girls’ Basketball team lost 3 games in their competition against the Prosper Rogers Eagles last night. The Blue “B” team lost their game, 2-23. Cayla Dailey scored 2 points, had 1 rebound and one steal. Jayde Joseph had 7 rebounds and 3 steals. Janie Gantt had 6 rebounds and 3 steals. The Gold “A” team lost, 12-39. Vanessa Masamba had 4 points and 3 steals. Taylor Jenkins had 2 points and 2 rebounds. Lauren Omholt had 2 points, 2 rebounds, and 5 steals. The White “C” team finished with a loss, 12-22. Peyton Miller had 5 points, 2 steals, and 3 rebounds. Jayden Villalobos-Pena had 2 points and 2 rebounds. Grayson Abcarian had some great offensive passes to her post players. The Dowell Lionettes went out with a mighty roar this basketball season, securing three wins against Scott Johnson Middle School. The Blue team fought through a nail biter of a game with a 28-20 win. Lead scorer of the night was Riley Boyd with 11 points, one of which was a beautiful 3-point shot, 4 rebounds, and 3 steals. Emily Heisner, Sydney Angell, Haley Rogers, and Kaylee Miller all contributed two points to the win. Sky Okolie had a standout game with 9 points, 5 rebounds, and 3 steals. This team works hard and plays harder! The second game of the night was exhilarating, as there was a point for point battle for the lead in the first half. The Gold team ended up on top with a 41-26 win. Top scorer of the night was Briana Griffin with 9 points, 1 block, 6 rebounds, and 1 steal. Close behind was Zaniya Williams with 8 points, 2 of which were 3-ponters, and 2 steals. McKenzie Parrish added 3 points, 8 quality rebounds, and 1 block to the teams win. Way to pull out the win ladies! In the last game of the night, the White team sealed the lead early and finished with a 28-6 win over Johnson. Lead scorer of the night was Olivia Sherman with 8 points, 7 rebounds, and 5 steals. Lauren Post made 2 points, 1 assist, and 4 steals for the Lionettes. Kamryn Sakson and Paige Maple both scored 4 points each for the night. Sakson also had 3 assists. Maple added 1 block and 4 rebounds. This team knows how to start and finish strong! The Dowell Lionettes Seventh Grade basketball teams played Rogers Middle School last night, one and losing two of the three games during the night. The Blue “B” team won a close game with a score of 17 - 15. Noel Sedgewick scored 5 points while Katie Shackleford and Kaylin Chapin each scored 4 points. Genevieve Miller led the defense with 12 rebounds and Kailyn Perry had 8 steals. Great season! Your coaches are proud of you! The Gold “A” team lost with a score of 15 - 27 after keeping it close for the first half. Natalee Rogers scored 7 points leading the offense. On defense, Sacha Pickett had 6 steals while Kira Thornton had 6 rebounds. Good job so far this season! Finish the fight this weekend! The White “C” team lost a nailbiter with 3 seconds left in the game with a score of 10 - 11. High scorers of the night were Rylie Hostetter and Kathryn Smith with 4 points each. Alanna Copado also contributed 2 points. Allison Lane had 8 rebounds through the game and Kaeleigh Stroud contributed 4 steals. Way to end the season with a fight to the finish! ​It was another exciting night of basketball for the Dowell Lionettes! Blue team outscored Rogers in almost every quarter of the game for a 22-11 win. Lead scorer of the night was Riley Boyd with 6 points, 1 assist, 2 blocks, 3 rebounds, and 2 steals. Sky Okolie added 5 points, one of which was a 3 pointer, 2 blocks, and 5 steals. Daishanae Cummings and Haley Rogers both scored 2 points each for the team. Cummings added 1 rebound and 2 steals, while Rogers had 1 assists, 2 blocks, and 3 steals for the night. Way to go Blue team on your continued success on the court! Gold team fought quarter to quarter until losing the final fight 16-29. Zaniya Williams had an impressive game as the lead scorer with 10 points, 3 of which were 3 pointers, 1 block, 3 rebounds, and 3 steals. McKenzie Parrish gave 4 points to the team, along with 1 block, 7 impressive rebounds, and 1 steal. Lauren Trujillo also scored 2 points for the team, played killer defense and got 3 rebounds, and 4 steals. These girls are among the hardest fighters and toughest players we’ve ever seen. It so exhilarating to be a part of this team! Keep working girls! White team finished up the night with a hard fought win over Rogers in a 29-16 lead. Lead scorer for the white team was Emely Ortiz with 6 points, 2 rebounds, and 1 steal. Lesly Gonzalez, Olivia Sherman, and Kamryn Sakson all added 4 more points each to the Lionettes final score. Gonzalez also had 2 rebounds and 1 steal. Sherman had 1 block, 4 rebounds, and 5 steals. Sakson had 3 rebounds and 1 steal. We can’t get over how much this team has grown from beginning to the end of this season. They are true winners in every sense of the word! The Dowell Lionettes Seventh Grade basketball teams played Rogers Middle School last night, winning all two of the three games! The Blue “B” team won 15 - 10 after a great comeback. We were down 3 - 9 at the half and outscored Rogers 12 - 1 in the second half! Gigi Miller led with 4 points and 10 rebounds. Katelyn Walerczyk and Kaylin Chapin each added 7 rebounds. The Patriots got nothing on us! Great job Blue!! The Gold “A” team lost with a score of 11 - 24. Both Hannah Billeter and Sacha Pickett had 4 points each while Kira Thornton and Gracie Branson led the defense with 7 rebounds each. Very proud of how we kept fighting all the way through! The White “C” team won with a score of 10 - 8. High scorer of the night was Allison Lane with 4 points. Allison Lane was also the leading rebounder with 7 solid rebounds under the basket. Allie Zarbaugh and Riley Thomason each contributed 3 rebounds to the team’s total. Kaeleigh Stroud had 3 steals throughout the game. Excellent teamwork by everyone!! The Blue “B” team and the White “C” team will play this Saturday at Evans for their end-of-season tournament. One Heart, One Team, LIONETTES! In the most exciting games of this season yet, the Dowell Lionettes faced Faubion Middle School. The Blue team finished on top with a final score of 33-10. Lead scorer of the night was Riley Boyd with 2 points, 1 assist, and 4 steals. Not far behind was Sky Okolie with 8 points, 5 rebounds, and 2 steals. Kaylee Miller added 4 points to the teams score, 1 rebound, and 3 steals. Way to work from start to finish Lionettes! The Gold team lost in a heartbreaking game with a score of 25-29. Top scorer of the night was Zaniya Williams with 10 points, one of which was a 3 pointer, 1 jaw dropping block, and 4 steals. Jenna Davies and Landry Worsham also had 3 pointers for the Lionettes. Briana Griffin added 3 points, 2 rebounds, and 2 steals for the night. Anna Price put up 2 points, 2 rebounds, and a steal. It was a tough loss for the Lionettes, but they fought until the last second of the game. In their highest scoring game of the season, the White team won 29-8 against Faubion. In an exciting first quarter, lead scorer Olivia Sherman put up 10 points, with a total point count of 15 points for the night. She also had 4 rebounds and 5 steals. So impressive! Paige Maple added 4 points to the Lionettes win. Bell Gonzalez made 2 points, 2 assists, 1 rebound, and 4 steals. Finally, Emely Ortiz added 6 points to the Lionettes win, 2 of which were free throws, and 6 steals. This team shows consistent growth each week. Keep working hard White team! The Dowell Lionettes Seventh Grade basketball teams swept Faubion Middle School last night, winning all three of their games! The Blue “B” team won 21 - 14. Vanessa Mejia led the team in offense with 10 points. It was a team effort on defense with Perry, Mejia, Walerczyk, Chapin, and Miller all having 5 rebounds each! Great job Blue!! The Gold “A” team won with a score of 15 - 6. The shots were spread out tonight with 6 of the girls contributing to the 16 points. Kira Thornton and Avery Calame led the team in rebounds with 9 and 8 respectively. Landry Edwards added 6 steals to the defensive efforts. Way to work hard ladies!! The White “C” team won with a score of 13 - 8. High scorers of the night were Rylie Hostetter and Allison Lane with 4 points each. Allison Lane was also the leading rebounder with 15 solid rebounds under the basket. The team had a combined 28 steals throughout the game. Excellent teamwork by everyone!! Our next game is away at Rogers Middle School on February 6th starting with the first game at 5:00pm. One Heart, One Team, LIONETTES! Dowell faced Prosper Reynolds in this week’s district match up. All teams fought hard throughout their games, but fell short of winning within the last minutes of their games. Blue team lost their game to Reynolds 10-33. High Scorer for the Blue team was Riley Boyd with 6 points, 4 rebounds, and 2 steals. Sydney Angell and Ardenne Fleitz also added two points to their score. Sydney also had two rebounds and a steal. Kaylee Miller fought hard for 4 steals, 2 rebounds, and an impressive blocked shot. This team shows great improvement and effort with each game of the season. Gold team had a hard fought game with Reynolds. They were neck and neck with their opponents up until the final minutes of the fourth quarter. High scorer of the night was Avery Boring with 6 points, 2 of which were free throws, 1 assist, 2 blocks, 1 rebound, and 4 steals. Briana Griffin added 2 points, 1 blocks, 2 rebounds, and 1 steal for the team. Chiola Oladele put up 4 points, 1 block, 3 rebounds, and 1 steal for the gold team. These girls have overcome so much in this short season and continue to fight for every game. Dowell White team lost in the last moments of their game against Reynolds. What an exciting game! Almost every member of the white team scored. Makenna Scott had 3 points, Emely Ortiz had 2 points, Emily Hudson had 2 points, Lauren Post had 2 points, Olivia Sherman was the lead scorer with 5 points, and Isabella Gonzalez had had 2 points. What a great show of sportsmanship and teamwork. We are very proud of each of our teams! The Dowell Lionettes Seventh Grade basketball teams played against the Prosper Reynolds Eagles last night and won 1 of the 3 games. The Blue “B” team won 20 - 11. They held the lead the entire game playing with much toughness. Katelyn Walerczyk led the team with 6 points followed closely by Kailyn Perry with 5 of her own. Mckenna Prather, Kaylin Chapin, and Walerczyk combined for 20 rebounds! Great job Blue!! The Gold “A” team, while having a tough night, kept fighting. Kira Thornton had 6 rebounds. Landry Edwards and Jacie Schussler added 3 steals each to that effort. The White “C” team lost their game with a score of 9 - 17. Allison Lane contributed 4 points during the night and also had 7 rebounds. Point guards Kathryn Smith and Mollie Kleman each had 4 steals. Alanna Copado had 3 steals and 3 rebounds. Way to fight! The Dowell Lionettes had a tough match up this week with Cockrill. The girls worked through a new defense and some very fast-paced game play. Dowell Blue team took the Lionettes only win for the night with a 25-20 lead over Cockrill. Haley Rogers was the lead scorer with 9 points, 4 of which were free throws and a 3 point shot. She also had an assist Sydney Angell added 4 points to the Lionettes’ win. Sky Okolie had an impressive game with 6 points, 1 block, and 9 rebounds. Dowell Gold team took an early lead over Cockrill in the first half, but weren’t able to cinch the win for the night in a 17-26 loss. New comer Riley Boyd assisted the team with a free-throw, a block, and some great rebounds. Avery Boring was the lead scorer for the night with 6 points, 1 block, and 5 rebounds. Landry Worsham added a 3 pointer for the team, 2 rebounds, and 2 steals. Dowell White team had their first true loss of the season in a heartbreaking 11-16 loss to Cockrill. Lauren Post fought hard for her free-throw point, 1 block, 1 rebound, and 6 steals. Kamryn Sakson added 2 points, 1 assist, 2 rebounds, and 3 steals for her team. Paige Maple and Olivia Sherman both had 4 points for the team as the lead scorers for the night. Paige also had an assist. Olivia had 3 blocks and a rebound. The Dowell Lionettes Seventh Grade basketball teams had a hard night against the Cockrill Cowgirls, winning two of the three games. The Blue “B” team won in overtime with a score of 24-22. After being down 4 - 10, the team fought hard to get back in it. Both Kailyn Perry and Vanessa Mejia each scored 8 points to lead the team. They also led the team with 13 steals combined. Both McKenna Prather and Kaylin Chapin each had 7 rebounds to lead the defense effort. The Gold “A” team lost but had some great moments. Kira Thornton led on defense with 5 rebounds and Jacie Schussler added 7 steals to that effort. The White “C” team won an exciting game with a score of 23-9. Defensive player of the night was Kaeleigh Stroud, forcing 3 turnovers with her defensive moves. Mollie Kleman had 5 steals to help lead the team to victory. Top scorers of the night were Allison Lane and Nathanim Kidane with 6 points each. Way to end the night strong! Dowell Lionettes faced Evans at Boyd High School in this week’s match up. The Lionettes were very excited for the opportunity. The girls have worked hard all week and showed much improvement in many areas. The blue team fought hard and barely fell short in a 13-12 loss against Evans. Lead scorer for the blue team was Riley Boyd with 6 points, 2 of which were free-throws, 5 rebounds, and 2 steals. Sky Okolie also contributed another 4 points, 6 rebounds, and 2 steals. Makayla Smith added a free throw, 4 rebounds, and 1 steal for her team. These girls fought hard until the very end in this tough loss. We will continue to work hard and grow every day. Way to hustle blue team! The gold team also fought hard but came up short to Evans with a 37-22 loss. Lead scorer, McKenzie Parrish, put up 7 points, 3 of which were free-throws, 5 rebounds, and 1 steal. Another big contributor to the Lionettes game was Avery Boring with 5 points, 2 rebounds, and 1 steal. Briana Griffin put up 4 points and 4 strong rebounds for the Lionettes. We are so proud of your strength and perseverance gold team. Keep fighting! The white team came out with the only win for the night for the Dowell Lionettes with a 14-11 win over Evans. Lead scorer for the white team was Kamryn Sakson with 5 points, 2 rebounds, and 2 steals. Emely Ortiz dominated the court with 3 points, 4 steals, and some extremely impressive defensive skills. Lesly Gonzalez added 3 points, 1 rebound, and 1 steal for the Lionettes team win. White team continues to amaze us each week. They grow each week and strive to be the best they can be at all times. Great job white team! ​We look forward to the next week of practice to implement some new material and adjust what we already know. The Lionettes consistently grow as player’s week by week. We look forward for the weeks to come. One heart, one team! The Dowell Lionettes Seventh Grade basketball teams had a hard night against the Evans Panthers, winning one of the three games. The Blue “B” team won in a nail biter, 24-21. Kaitlyn Walerczyk scored 6 points and Kailyn Perry scored 5 points as our leading scorers. Both Kaitlyn Walerczyk and McKenna Prather each had 5 rebounds. The whole team really had to dig deep to keep the lead. Great win girls. The Gold “A” team lost 16 - 26. They were holding on when in the last quarter, Evans pulled away for good. Natalee Rogers led the team in scoring with 9 points while Kira Thornton and Avery Calame added 4 and 3 respectively. Hannah Billeter led the defense again with 6 rebounds. We keep seeing sparks of greatness from this group! The White “C” team lost a hard-fought game with a close score of 12 - 14. High scorers of the night were Alanna Copado, Allison Lane and Nathanim Kidane with 4 points each. Kaeleigh Stroud had strong defense moves with 4 steals and Bianca Diaz had 3 rebounds. Way to fight hard until the very end! Our next game is away against Cockrill Middle School on January 18th starting with the first game at 5:00pm. One Heart, One Team, LIONETTES! What an exciting week to be a Dowell Lionette! 8th grade basketball swept all three of the Johnson Middle School teams in this week’s games. The Lionettes fought hard in all three games and came out victorious. In Dowell’s Blue team game, the Lionettes took the lead early and held it to finish the game 20-10. One of the standout players of the night was Riley Boyd with 8 points, 4 rebounds, and 2 steals. Makayla Smith also put up 8 points and added 5 rebounds and 1 steal for her team. Point guard Haley Rogers racked up 4 points, 4 rebounds, and 2 steals. Even with the early lead, the girls played their hardest throughout the entire game and never gave up on their goal to win. Way to go Blue team! In the second match up of the night, the Gold team dominated the court in a 40-20 win over Johnson. Lead scorer for the Gold team was Chiola Oladele with 10 points and 2 strong rebounds. Zaniya Williams also added to her team’s success with 5 points, one of which was a 3-point shot, and some very impressive defensive moves. Avery Boring contributed 3 points to the team, along with a steal that allowed her the opportunity for a full court layup. Nice work Gold team! In a nail biter of a game, the White team pulled out a 21-16 win over Johnson. Each quarter was neck and neck until these girls showed true heart and fought through until the end. Olivia Sherman dominated the floor with 8 total points and 3 steals. Emily Ortiz contributed another 4 points and her impressive defensive skills to the team’s win. Priscilla Browne also earned 4 points and 3 rebounds to add to the victory. We are so proud of the White team! We are beyond proud to be a part of a program where the girls work so hard and dedicate so much time to this sport. We feel we have the best group of student athletes and are so thankful to be there coaches. As tonight showed, hard work pays off. One heart, one team! The Dowell Lionettes Seventh Grade basketball teams had an amazing night with a sweep against the Scott Johnson Tigers. This is the first time all 3 teams have won in one night and we are very proud of all their hard work. It is paying off girls! The Blue “B” team won in a decisive game, 28 - 11. Seven out of the nine girls present scored tonight making this an all around team effort. Vanessa Mejia led with 7 points followed by Kailyn Perry with 6. Noel Sedgwick and Emily Heaton both had great nights taking care of the ball as our points guards! The Gold “A” team won an exciting game with a score of 23 - 19. Kira Thornton led the scoring for the Gold team with 8 points and Sacha Pickett added in her 7 points and helped on defense with 5 steals as well. Hannah Billeter led on defense with 7 rebounds. Nice job to everyone on the team! The White “C” team finished with a hard fought win 17 - 8. High scorer of the night was post player Nathanim Kidane with 6 points and also 5 rebounds. Leading rebounder of the night was Riley Thomason with 6 strong rebounds. Kathryn Smith and Bianca Diaz each had 3 steals and a combined 7 points. Congratulations on a great win! Dowell Lionettes faced the Highland Park Lady Raiders on December 12, 2016. All teams showed their best efforts on the court and played with their hearts until the very last buzzer. ​Dowell Blue team barely fell short of a win with a score of 15-18. Lead scorer of the night for blue team was Riley Boyd with 9 points, including a free throw, 8 rebounds, and 4 steals. Daishanae Cummings also showed a presence on the court with 4 points, 3 blocks, and 1 steal. Sky Okolie contributed 3 rebounds and a steal to the Blue team. Keep working hard Blue team. You left it all on the floor! Dowell Gold team met there first true loss of the season in a 15-24 showdown against the Lady Raiders. Chiola Oladele was the lead scorer with 5 points, all of which were free throws, 2 blocks, and 8 rebounds. Breana Griffin added a nice jump shot for 2 points for the Lionettes, along with 3 rebounds. Olivia Witte stepped up to play a new position as point guard and added 4 points for the team, 3 rebounds, and a steal. Way to hustle Gold team. Keep moving forward. Dowell White team closed out the night with the only win for the Dowell Lionettes with a final score of 24-15. Emely Ortiz had a solid night with 6 points, 2 rebounds, and 2 steals. Olivia Sherman contributed 4 points and 8 rebounds for the Lionettes. Emily Hudson had a strong 4 points, a well. We are so proud of your hard work tonight ladies! The Dowell Lionettes will be back in action January 5 after the break. Keep working hard to meet our goals. One heart, one team. Lionettes!!! The Dowell 8th grade basketball teams played their season opener against Prosper Rogers on December 8th. Each team fought hard to secure two out of three wins against Rogers. The Blue “B” won their game 13-7 in a well played match. Kaylee Miller was a strong contributor to her team with 4 points, 1 rebound, and two steals. Ardynne Fleitz also played well for her team with 2 points and 4 steals. Sky Okolie dominated the court for her team with 4 points, 3 rebounds, and 3 steals. Congratulations on your first season game win! The Gold “A” competed well and came out on top with a 34-31 win against Rogers. Chiola Oladele put up a strong 10 points, 1 assist, and 2 rebounds. Jenna Davies earned her team 6 points, 1 assist, 2 rebounds, and 3 steals. Landry Worsham conquered the court with an astounding 7 points, 3 rebounds, and 2 steals. Way to go A team on a well deserved win! Good luck on your tournament this weekend at Frisco Stafford! Closing out the evening, the White “C” team fought hard but lost 18-10. Kamryn Sakson was a stand out player with 4 points, 2 rebounds, and 1 steal. Emely Ortiz contributed to her team with 2 points and a rebound. Olivia Sherman racked up 4 points, 1 rebound, and 4 steals. We are so proud of the efforts and heart of this team! We are incredibly excited to see what the future holds for these athletes and this season. Gold “A” team begins their tournament this weekend at Frisco Stafford tomorrow night, December 9. We wish them luck and great success on the road this weekend. One heart, one team. Lionettes! The Dowell Lionettes Seventh Grade basketball teams won 2 and lost 1 in their games against the Prosper Rogers Eagles tonight. The Blue “B” team won in a decisive game, 25-6. Kailyn Perry led the team with 7 points and 9 steals. Vanessa Mejia contributed 6 points and 4 rebounds. Katelyn Walerczyk also had 4 points and 7 steals. The Gold “A” team lost 12-34. Kira Thornton was the leading scorer with 4 points and 5 rebounds. Gracie Branson had 2 points and 4 rebounds. The White “C” team finished with a hard fought win 14-12. Alanna Copado had 4 points and 4 steals. Kathryn Smith also had 4 points and 2 steals. Leading rebounder for the night was Nathanim Kidane with 5 rebounds. The 8th grade Dowell Lionettes played three great games Tuesday night against Allen Curtis. All teams fell short, but played extremely tough. The Blue “B” team fell short with a score of 22-21. Leading scorers were Madi Bissa with 10 points, and Tyria Seagraves and Edom Kidane each with 4. As a team, they totaled 21 steals and 27 rebounds. Nice work, ladies! The Gold “A” team battled to the very end, falling short 24-16. Marlee Sprott led the team with 6 points, while Skyler Wesley, Anissa Lechner, Shelby Luther, Kiara Bolden and Ava Slade all added in 2 of their own. Way to work until the end, girls! The White “C” team also battled hard, falling short 36-6. Olivia Bettin led the night with 4 points while Annika Baxter added 2 of her own. Sofia Alani contributed 5 big rebounds on the defensive side while Tayleigh Wardlaw added 6 rebounds. Way to work hard ladies! Tuesday night wrapped up the season for the White and Blue teams. Gold team will play in their end of season tournament February 13th at Johnson Middle School at 8:00am. ONE HEART, ONE TEAM, LIONETTES! The Dowell Lionettes seventh grade basketball teams played their last 3 games of the season against Royse City Middle School in Rockwall on February 8. The White “C” team started the night losing 15-22. High scorer of the game was Sydney Angell with 6 points and 3 steals. Paige Maple had an awesome 3-pointer at the buzzer. Leading rebounder was post player Savannah Black with 6 rebounds and 4 steals. Way to work hard this season, ladies! The Gold “A” team lost 18-34. High scorer of the night was post player Olivia Witte with 9 points and 3 rebounds. Anna Price and Chiola Oladele each had 4 rebounds. Jenna Davies and Olivia Tenney each contributed 2 points. Good luck at your tournament this weekend! Ending the night, the Blue “B” team won their game 32-14, scoring the most points of the season! Bri Griffin scored the most points of the night, contributing 10 points. Kaylee Miller had an awesome 3- pointer at the buzzer. Outstanding rebounder of the night was McKenzie Parrish with 5 rebounds. Gaby Griffin had an amazing game, scoring 9 points and stealing the ball 8 times. Great teamwork and excellent season! The Gold “A” team will play the end of season tournament this Saturday starting at 10:00 at Evans Middle School. One Heart, One Team, LIONETTES! The 8th grade Dowell Lionettes played three intense games Thursday night against Highland Park. Blue team came out with a clenching win, while Gold and White (by two) fell short. The Blue “B” team began the night with a score of 18-16. High scorers for the night were Bailey Walerczyk with and Edom Kidane, adding in 3. Tyria Seagraves led the team with 10 rebounds and Kidane securing five. So proud, ladies! The Gold “A” team fell short with a score of 39-18. High scorers were Marlee Sprott with 5 points, Ashlyn Voss with 3 points, and Anissa Lechner with six. Adyson McBride helped out with 5 rebounds and Voss had 4 big boards. Sprott added in five quick steals. Great work, girls. The White “C” team also battled to the last seconds, unfortunately falling short 23-25. Leading scorers were Olivia Bettin and Tayleigh Wardlaw with 7 points each. As a team, the girls totaled 20 steals and 38 rebounds! Annika Baxter contributed with 8 rebounds. Awesome work, ladies! The next games are on Saturday for the B/C Team Tournaments, hosted here at Dowell. The next and last game of the season is on Tuesday, February 9th, location TBD. ONE HEART, ONE TEAM, LIONETTES! The Dowell Lionettes seventh grade basketball teams played 3 games against Highland Park Middle School on February 1. The Blue “B” team started off losing a close and exciting game with a score of 23-24. High scorers of the night were Isabella Heilman and Bri Griffin with 6 points each. Post player McKenzie Parrish had 8 rebounds and 4 steals. Kaylee Miller also had 4 steals and 5 strong rebounds under the basket. Keep working hard! The Gold “A” team lost their game 14-45. Outstanding rebounder of the night was post player Olivia Witte with 6 rebounds. High scorer of the night was Avery Boring with 4 points. Jenna Davies, Landry Worsham and Chiola Oladele each had 2 points. Keep persevering! Ending the night, the White “C” team lost a great game in overtime with a score of 15-19. High scorer of the night was Savannah Black with 6 points and 2 steals. Paige Maple had 3 points, and Georgina Chen, Kamryn Sakson, Sydney Angell and Emily Hudson each contributed 2 points. So proud of your fight! The next game is against a school to be determined on Monday, February 8th at a place to be announced soon, starting at 5:00pm. One Heart, One Team, LIONETTES! The 8th grade Dowell Lionettes played three games Thursday night against Reynolds Middle School. Blue team came out with a win, while Gold and White fell short. The Blue “B” team finished the night with a score of 24-21. High scorers for the night were Madi Bissa with 10 points and Mailei Derby and Rachel Beason each adding in 3. Tyria Seagraves and Bissa added in a combined 15 rebounds. Nice work, ladies! The Gold “A” team fought hard, falling short with a score of 40-17. High scorers were Marlee Sprott with 4 points, Ashlyn Voss with 6 points, and Trinity Needham with 5. Anissa Lechner contributed with 5 big rebounds. Adyson McBride helped out by having 2 big blocks on Propser. Great work, girls. The White “C” team also fought out a tough game unfortunately falling short 26-20. Leading scorer was Olivia Bettin with 14 points. As a team, the girls totaled 31 rebounds! Annika Baxter contributed with 7 steals. Awesome work, ladies! The next game is against Highland Park at Highland Park Middle School on February 4th, starting at 5:00pm. One Heart, One Team, LIONETTES! 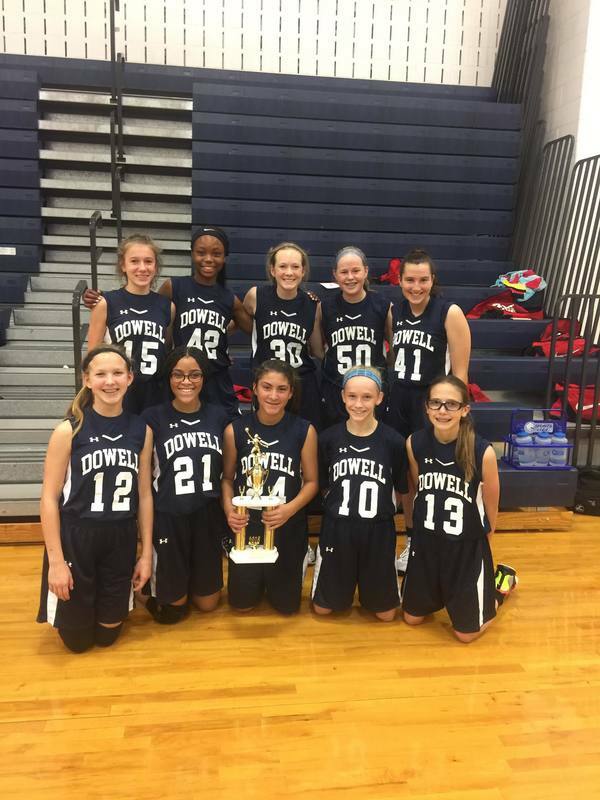 The Dowell Lionettes seventh grade basketball teams played 3 games against Prosper Middle School on January 25, and won 1 of the 3 games. The Blue “B” team started off strong, winning 29-15. High scorer and rebounder of the night was post player McKenzie Parrish with 11 points and 6 rebounds. Isabella Heilman had 3 blocks and aggressive defensive moves. Emily Heisner had 6 points and 4 steals. Bri Griffin had 10 points, 4 rebounds and 3 steals. Excellent job! The Gold “A” team lost their game with a close score of 24-28. Leading scorer of the night was point guard Zaniya Williams with 14 points. Post player Olivia Tenney had 6 rebounds and 2 blocks under the basket. Anna Price also contributed 5 rebounds. Great game, ladies! Ending the night, the White “C” team lost with a score of 6-27. Paige Maple and Emily Hudson each had 2 points. Point guard Sydney Angell had 3 aggressive steals on defense. Post player Kate Leonard had 2 points and 7 rebounds under the net. Keep working hard! The next game is against Highland Park Middle School on February 1st at Highland Park, starting at 5:00pm. One Heart, One Team, LIONETTES! The 8th grade Dowell Lionettes played two games Thursday night against Faubion. Gold team fell short, but Blue team ended with a strong win. The Blue “B” team finished the night with a score of 29-20. Everyone on the team contributed in some way helping the Dowell Lionettes come out ahead. High scorers were Madi Bissa with 14 points and Chloe Becker with 4 points. Madi Bissa and Madison Hall each added in 6 rebounds. Awesome work, ladies! The Gold “A” team lost with a score of 27-11. Leading scorers were Trinity Needham with 3 points while Anissa Lechner, Marlee Sprott and Shelby Luther all added in 3 points of their own. Ashlyn Voss led the night with 6 rebounds. Great job, girls! The next game is against Prosper at Dowell Middle School on January 28th, starting at 5:00pm. One Heart, One Team, LIONETTES! The Dowell Lionettes Seventh Grade basketball teams won 2 and lost 1 in their games against the Faubion Lionettes last night. The Blue “B” team won solidly, 30 - 14. Isabella Heilman had 4 points and 3 blocked shots. Post player Mckenzie Parrish had 8 points, 2 rebounds, and 2 steals. High scorer of the night was Bri Griffin with 10 points, 3 rebounds, and 4 steals. The Gold “A” team lost 29 - 25. Point guard, Zaniya Williams led the team with 11 points, 2 rebounds and 2 steals. Chiola Oladele brought down 4 rebounds and had 6 points. Playing on another level tonight was Jenna Davies with 2 steals, 2 assists, and 3 points. The White “C” team finished with loss, 7 - 12. High scorer of the night was Savannah Black with 4 points and 4 rebounds. Aiden Varnell made a basket for 2 points and also had 2 rebounds. Kate Leonard had 2 rebounds, an awesome free throw, and aggressive play under the basket. Our next game is HOME against Prosper starting with the Blue game at 5:00pm. One Heart, One Team, LIONETTES! The 8th grade Dowell Lionettes played three exciting games against Evans Thursday night. White team came out with a victory, while Blue and Gold team both lost a tough battle. The Blue “B” team finished the night with a score of 24-13. Leading scorers for the night were Tyria Seagraves with 6 points and Kelsey Unger with 2. Seagraves also added 8 solid rebounds! Great work, ladies. The Gold “A” team lost with a score of 44-15. Marlee Sprott led the night with 8 points and 3 rebounds. Ashlyn Voss added in another 8 rebounds while Trinity Needham helped out with 4 steals. Great team effort, girls! The White “C” team had a great game against Evans, winning with a score of 26-17. The girls had the momentum the entire game. Olivia Bettin led the night with an impressive 16 points. Haley D’Angelo and Ashley Shaar both added in 4 points each. As a team, the girls had a total of 30 rebounds. Great work, girls!! The next game is against Faubion at Dowell Middle School on January 21st, starting at 5:00pm. One Heart, One Team, LIONETTES! The Dowell Lionettes Seventh Grade basketball teams won 1 and lost 2 in their games against the Evans Panthers last night. The Blue “B” team won solidly, 23 - 11. Mckenzie Parrish led the team with 9 points and 6 rebounds. Kaylee Miller and Bri Griffin each had 2 points and 4 steals. The Gold “A” team lost 27 - 41. Zaniya Williams led the team with 11 points and Olivia Witte had 8. Olivia Witte also led the defense with 6 rebounds. The White “C” team finished with loss, 6 - 11. Kate Leonard, Sydney Angell and Savannah Black each scored. Emely Ortiz and Kate Leonard pulled down 4 rebounds each to lead the defense. Our next game is HOME against Faubion starting with the Blue game at 5:00pm. One Heart, One Team, LIONETTES! The 8th grade Dowell Lionettes played three tough games against Willow Springs Thursday night. Blue and White teams came out with a great win, while the Gold team fell short. The Blue “B” team finished the night with a score of 24-15. High scorer of the game was Madison Bissa with 14 points. She also led the team in rebounds with 13 and steals with 11, earning herself a triple-double. Edom Kidane added 9 rebounds while Tyria Seagraves added 5. Great win, girls! The Gold “A” team lost with a score of 5-47. High scorers were Marlee Sprott with 2 points, Anissa Lechner with 3, and Ashlyn Voss with 1. Leading the night with rebounds was Voss with 7 and Marlee Sprott with five. Good hustle, ladies. The White “C” team had a great comeback against Willow Springs with a score of 26-22. Leading scorers were Tayleigh Wardlaw with 8 points, Olivia Bettin with 7, and Camryn Ciancia with five. Annika Baxter contributed with 9 solid rebounds and four steals. Baxter, Bettin, and Ciancia each with an assist. Great win, ladies! The next game is against Evans at Evans Middle School on January 7th, starting at 5:00pm. One Heart, One Team, LIONETTES! ​The 7th grade Lionettes basketball team played three games against Willow Springs on January 5th. The white “C” team started the night with a loss of 12-27. Savannah Black had 4 points and 6 steals. Twin sisters Aiden and Cailey Varnell had 4 rebounds each. Way to keep working hard ladies! The blue “B” did a wonderful job and won 25-18. Bri Griffin had 9 points, 5 rebounds and 7 steals. McKenzie Parrish had 8 points and 9 rebounds. Great consistent play and teamwork! The gold “A” team had a heart-breaking close game and lost in the last few minutes 22-23. Zaniya Williams had 12 points and 3 steals. Olivia Witte had 7 rebounds. Way to keep playing until the very end! The next game is against Evans Middle School on January 11 with games starting at 5:00pm. One heart, one team, Lionettes! The 8th grade Dowell Lionettes played a round of three intense games last night at Boyd High School. All three teams fell short to Cockrill Middle School, but we are proud of their determination to keep fighting. ​The Blue “B” team finished the night with a score of 22-9. High scorers of the night were Madi Bissa with 5 points and Chloe Becker with 2 points. Tyria Seagraves added 5 rebounds to help out the team’s defensive intensity. The Gold “A” team lost with a score of 20-11. Kiara Bolden, Morgan Bryan, Trinity Needhman, Ava Slade, and Marlee Sprott all contributed with 2 points each. Kiara Bolden led the team in rebounds, gathering 6 for the night. Ashlynn Voss chipped in 5 rebounds as well. The White “C” team had a tough battle against the cowgirls, losing 10-4. Ashlee Scharr led the night with 4 points. Annika Baxter added an impressive 9 steals while Schaar added 7 of her own. Leading the night in rebounds was Tayleigh Wardlaw with 7! The Dowell Lionettes Seventh Grade basketball teams won 1 and lost 2 in their games against the Cockrill Cowgirls tonight. The Blue “B” team lost a heartbreaker in overtime in the last 8 seconds, 18-19. Mckenzie Parrish led the team with 12 points and 7 rebounds. Baylee Burgess had 10 steals to help out on our fast breaks. The Gold “A” team won 27-17. Avery Boring led scorers with 8 points. Zaniya Williams added 7 points and Olivia Witte had 6. Olivia Witte also led the defense with 10 rebounds and Chiola Oladele had 7. The White “C” team finished with another tough loss in the last 8 seconds, 13-14. Mackenna Scott and Savannah Black tied for high scorer with 4 points each. Emely Ortiz pulled down 8 rebounds to lead the defense. Our next game is away against Willow Springs starting with the Blue game at 5:30pm. One Heart, One Team, LIONETTES! The 8th grade Dowell Lionettes played three tough games against Scott Johnson Thursday night. The gold team lost a close battle but blue and white teams each came away with a dominating win against the Lady Tigers. The Blue “B” team finished the night with a score of 31-6. High scorers of the night were Madi Bissa with 11 points and Madison hall with 6 points. Bailey Walerczyk ended the night with 6 big rebounds that helped keep the team’s defense strong. The Gold “A” team pushed hard throughout the game, but unfortunately lost 17-28. High scorers were Anissa Lechner and Marlee Sprott, each scoring 5 points. The entire team played tough the entire night. The Lionettes only allowed the Tigers to score two points in the first quarter. Great intensity, girls! Ending the night, the White “C” had a great win over SJMS 16-4. The entire team never backed down with their intensity. High scorers were Riley Cregg and Annika Baxter each with 4 points. Tayleigh Wardlaw and Rachel Allen added a combined 8 rebounds to help on the defensive side. Great hustle, ladies! The Dowell Lionettes Seventh Grade basketball teams won 2 and lost 1 in their games against Scott Johnson tonight. The Blue “B” team won their game, 16-2. Mckenzie Parrish had 8 rebounds and Gaby Griffin had 4 points and 5 steals. Baylee Burgess had 6 points and 7 steals. The Gold “A” team lost, 12-44. Zaniya Williams was high scorer of the night with 6 points. Chiola Oladele had 6 rebounds and 2 points. Olivia Witte also had 2 points. The White “C” team finished with a win, 9-7. High scorer of the night was Sydney Angell with 4 points. Post player Savannah Black had 3 points. Twin sisters, Cailey and Aiden Varnell, each had 3 rebounds. Our next game is against at home against Cockrill starting with the Blue game at 5:00pm. One Heart, One Team, LIONETTES! The 8th grade Dowell Lionettes fought out 3 intense games in Prosper on December 3rd. We lost, but we have a great foundation of play and hustle to build on for our district start next week. The Blue “B” team had a great fight, finishing with the loss 17-25. High scorers of the game were Kayla Minst with 6 points and Madi Bissa also with 6 points. Bailey Walerczyk and Bissa had 5 rebounds and Chloe Becker with two steals. The Gold “A” team pushed hard throughout the game, losing 12-47. High scorers were Anissa Lechner with 4 points and 3 steals and Ashlyn Voss with 4 points and 5 rebounds. The entire team had 4 blocks for the night; Shelby Luther with two. Ending the night, the White “C” had a great start, falling short 11-17. Tionte Hines had 5 points, 2 steals and 2 rebounds. Ashlee Schaar had 6 steals and 4 rebounds, and Tayleigh Wardlaw had 5 rebounds. Great hustle, ladies! The next game is against Johnson Middle School on December 10th at Dowell, starting at 5:00pm. One Heart, One Team, LIONETTES! The Dowell Lionettes Seventh Grade basketball teams lost 3 games to the Prosper Reynolds Eagles wins tonight. The Blue “B” team lost their game 19-37. Brianna Griffin was the high scorer with 8 points and Mackenzie Parrish had 7. Defensively, Kaylee Miller and Baylee Burgess racked up 6 rebounds together and Mackenzie Parrish had 5 steals. The Gold “A” team lost 29-33 in overtime. Zaniya Williams was high scorer with 19 points. Olivia Witte and Riley Boyd had great defensive games having 6 rebounds and 6 steal combined. The White “C” team finished with a loss at 8-34. Kamryn Sakson was the high scorer with 6 points while also having 3 rebounds. Savannah Black had 5 steals and Cailey Varnell had 4 helping their team out defensively. Our next game is Monday, December 7th at home against Scott Johnson starting with the Blue game at 5:00pm. One Heart, One Team, LIONETTES! The 8th grade Dowell Lionettes traveled to Allen to play Ereckson Middle School last night. The Blue “B” team played a tough game last night falling short with a score of 32-4. Never once during the game did the girls slow down their intensity or give up. Grace Boggs and Olivia Doles contributed to the score to help the team offensively. Great season girls! The Gold “A” team also had a tough fight last night against Ereckson. The team fell short with a score of 39-18 but never stopped fighting. Amaya Cudgo had an early 8 points to help get the team’s momentum going early. Landri Maxfield added another 4 points. Good work girls, keep fighting! The White “C” team played a good game against Ereckson but unfortunately fell short with a score of 23-15. Symmone James and Kylie Brakebill were the high scorers with a combined 10 points. The entire team contributed with rebounds to help with the defensive intensity. Great season girls! Gold team finishes off their season this weekend at the district tournament at Faubion. The Dowell Lionettes seventh grade basketball teams played their last 3 games of the season against Cain Middle School in Rockwall on February 9. The White “C” team started the night strong, winning 14-7! High scorer of the game was Annika Baxter with 6 points. Edom Kidane also contributed 5 points. Rachel Beason had 6 steals and 2 points. Tyria Seagraves had 5 rebounds, 3 steals and a free throw shot. Madison Hall and Skyler Wesely each had 3 steals. Way to end the season strong, ladies! The Blue “B” team lost 10-13. High scorer of the night was post player Morgan Bryan with 4 points and 5 rebounds. Shelby Luther also had 5 rebounds and 4 steals. Olivia Bettin, Megan Davis and Reyna Aguilera each had 2 points. Kelsey Unger and Ashley Schaar each had 3 steals. Great season ladies! Ending the night, the Gold “A” team lost their game 14-24. Post players Madison Bissa and Ashlyn Voss each had 4 points. Anissa Lechner had 3 points from free throws and 2 steals. Adyson McBride had 2 points, 3 rebounds and a steal. Outstanding rebounder of the night was Ellie Pickett with 5 rebounds. Thanks for never giving up! The Gold “A” team will play the end of season tournament this Saturday starting at 8:00 at Scott Johnson Middle School. One Heart, One Team, LIONETTES! The 8th grade Dowell Lionettes traveled to Highland Park last night to finish up regular district games. The Blue “B” team had a tough game against Highland Park, unfortunately falling short 24-12. 6 different players scored helping to contriubute to the final score. Alexis Calabrese and Grace Boggs added a total of 10 rebounds. Good work girls! The Gold “A” team also played a tough game, falling short with a score of 29-38. Amaya Cudgo led the team in scoring with 12 points while Miranda Rotunno added in another 4 points. Avery Voss contributed 5 big rebounds to help defensively. Keep working hard girls! The White “C” team had a solid win against Highland Park last night. The final score was a dominating 26-9. The team did not let the lady Raiders score a single point in the entire first half because of their awesome defensive intensity! Alise West led the team in scoring with 8 points while Cat Sears and Danielle Johnson added in another 4 points each. The White team finished up district play undefeated! Great work ladies! The next games are this weekend. The Blue and White teams play in the end of district tournament at Faubion Middle School. The Dowell Lionettes seventh grade basketball teams played 3 games against Highland Park Middle School on February 2. The Blue “B” team started off losing 9-25. High scorer of the night was post player Morgan Bryan with 4 points and 7 steals. Bailey Walerczyk had 2 points and 6 rebounds. Kelsey Unger had 2 points and 3 rebounds. Keep working hard! The Gold “A” team lost their game 6-26. Trinity Dudek and Marlee Sprott each had 2 points. Adyson McBride had 2 assists. Ashlyn Voss had 8 rebounds, 3 steals and 2 points. Keep persevering! Ending the night, the White “C” team lost a great game in overtime with a score of 15-19. High scorer of the night was Tyria Seagraves with 6 points and 5 steals. Annika Baxter had 2 points and 2 rebounds. Rachel Season and 2 points and 5 steals. Edom Kidane had 3 rebounds and 2 free throws. Outstanding rebounder of the night was Kyrah Hendrix with 9 rebounds. So proud of your fight! The next game is against Highland Park Middle School on February 9th at a place to be announced soon, starting at 5:30pm. One Heart, One Team, LIONETTES! The 8th grade Dowell Lionettes had an exciting night last night playing Reynolds Middle School on family night. The Blue “B” team had a close game against the Eagles falling short with a score of 17-19 in overtime. The girls fought hard to the very end. JJ Coleman led the team in scoring with 8 points while Grace Boggs and Lexi Maxfield added in another 4 points. Alexandra Ponce contributed with 4 big rebounds. Good work ladies! The Gold “A” team had a tight win last night against Reynolds with a final score of 16-15. They kept the momentum the whole game working together as a team. Miranda Rotunno, Skylar Struck, Kionce Woods, and Amaya Cudgo all contributed offensively to seal the victory. Each team member worked hard to help contribute to the win. Awesome teamwork girls! The White “C” team had a solid win against the Eagles, beating Reynolds 25-5. Alise West and Kylee Brakebill were high scorers, scoring 6 points each. Cassidy Bergenthal, Symmone James, and Danielle Johnson also contributed to the scoring helping the team with the big win. The girls are working awesome together and are on a role. Awesome job girls! The next game is on February 5th at Highland Park, starting at 5:00pm. 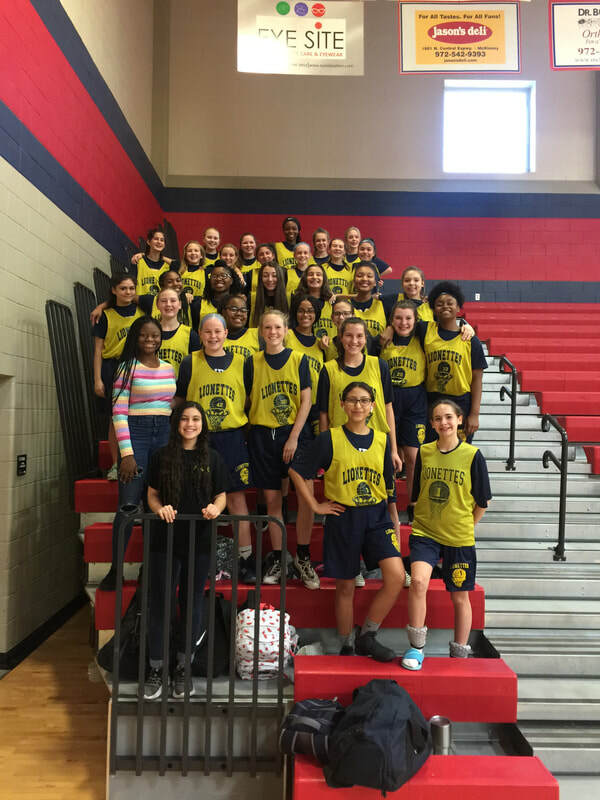 The Dowell Lionettes seventh grade basketball teams played 3 games against Prosper Middle School on January 26. The Blue “B” team started off losing 18-24. High scorer of the night was post player Morgan Bryan with 8 points. Shelby Luther scored 4 points and Bailey Walerczyk had 3 rebounds. Kelsey Unger had 3 steals and 3 rebounds. Best game of the season, ladies! Great job! The Gold “A” team lost their game 10-31. Marlee Sprott had 4 points and Ellie Pickett had 2 points and 3 rebounds. Kayla Minst and Madi Bissa each had 2 points. Keep working hard! Ending the night, the White “C” team lost with a score of 12-18. High scorer of the night was guard Rachel Beason with 6 points. Annika Baxter had 4 points and Racheal Readus had 2 points and 5 steals. Kaley Pippin and Tyria Seagraves each had 5 rebounds. Great game, ladies! The next game is against Highland Park Middle School on February 2nd at Highland Park, starting at 5:00pm. One Heart, One Team, LIONETTES! The 8th grade Dowell Lionettes had more exciting games last night as they played Faubion at Mckinney High School. Again, all teams came out with a victory! The Blue “B” team had a close win against Faubion with a final score of 14-9. Grace Boggs led the team in scoring with a solid 7 points. Olivia Doles, Ainsley Bingham, and Alexandra Ponce all helped defensively by adding in some big rebounds. Great win girls! The Gold “A” team had a big win last night beating FMS 35-13. Amaya Cudgo led the way with 16 points! Kionce Woods added in another 6 points while Skyler Struck and Landri Maxfield added another combined 8 points. Anna Voss had 3 rebounds to help add to the defensive intensity that Faubion could not handle. Great team win ladies! The White “C” team also had an exciting win beating Faubion 33-14. Cassidy Bergenthal and Symmonne James led the way with 8 points each, while Lynley Lawhon added in another 6 points! Audrey Lane had 3 big rebounds to help the Lionnettes seal the victory. It was a high energy game and the whole team played a big part in the victory. Great work girls! The next game is on January 29th against Reynolds Middle School at Dowell, starting at 5:00pm. Go Lionettes! The Dowell Lionettes seventh grade basketball teams played 3 games against Faubion Middle School on January 20. The Blue “B” team started off losing 6-26. Bailey Walerczyk and Brooke Mayer each scored 2 points. Shelby Luther had 2 points from free throws. Chloe Becker and Olivia Bettin each had 3 steals. Morgan Bryan had 6 rebounds. Keep working hard! The Gold “A” team lost their game 16-37. Post players Madison Bissa and Ellie Pickett each had 4 points. Adyson McBride had 3 points and 2 steals. Trinity Dudek had 2 points and 3 rebounds. Way to improve each week! Ending the night, the White “C” team lost with a score of 6-24. High scorer of the night was post player Edom Kidane with 4 points and 10 rebounds. Kyrah Hendrix had 9 rebounds. Annika Baxter and Tyria Seagraves each made a free throw. Keep learning and growing! The next game is against Prosper Middle School on January 26th at Dowell, starting at 5:00pm. One Heart, One Team, LIONETTES! The 8th grade Dowell Lionettes had another week of sweeping their opponent! All teams came out with a victory against Evans Middle School! Every team still remains undefeated in district play. The Blue “B” team had a great win with contributions from everyone on the team. Final score was 19-17. Grace Boggs led the team with 10 points! JJ Coleman chipped in another 5 points to help seal the victory. Defensive effort from the whole team helped the girls dominate the second half. Great work girls! The Gold “A” team had a tight win with a score of 24-20. The team played with high intensity that was unable to be stopped. Amaya Cudgo led the team in scoring with 8 points while Avery Voss chipped in another 7 points. It was a great team effort. Great job girls! The White “C” team also had an exciting game beating Evans 11-8. Cassidy Bergenthal led the team in scoring with 4 points. Alise West and Audrey Lane added a total of 12 rebounds to help get them the team the win. Cat Sears also contributed 4 big steals! Great work ladies, keep working hard! The next game is on January 22th against Faubian Middle School at McKinney High, starting at 5:00pm. The Dowell Lionettes seventh grade basketball teams played 3 games against Evans Middle School on January 12. The Blue “B” team started off losing 7-8. Post player Shelby Luther was the high scorer with 4 points. Chloe Becker and Olivia Bettin each had 5 steals. Morgan Bryan had 6 rebounds and 3 points. Keep working hard! The Gold “A” team lost their game 9-44. Post player Ashlyn Voss had 3 points and 3 rebounds. Madison Bissa and Adyson McBride each had 3 steals . Sailor O’Gara had an awesome 3 pointer in the third quarter. Way to fight until the end! Ending the night, the White “C” team lost with a score of 8-22. High scorer of the night was Skyler Wesely with 3 points. Tyria Seagraves and Kyrah Hendrix each had 2 points and a combined 9 rebounds. Madison Hall had 3 steals and Edom Kidane had 3 rebounds. Keep learning and growing! The next game is against Faubion Middle School on January 20th at Dowell, starting at 5:00pm. One Heart, One Team, LIONETTES! The 8th grade Dowell Lionettes swept Willow Springs last night with all teams getting a win! The Blue “B” team pulled out a close win against the lady leopards! The final score was 22-20. It was a total team effort from all of the girls! Leading scorers were Grace Boggs with 13 points. Olivia Doles added in another 5 points to help seal the victory! Great job girls. The Gold “A” team had another exciting game last night getting the win with a score of 21-20. Leading scorers were Amaya Cudgo with 10 points, and Kionce Woods with 5. The girls stuck together the entire game to help pull out the close win! Awesome job! The White “C” also had an exciting game, beating Willow Springs 17-14. Leading scorer was Symmone James with a solid 12 points! Alise West contributed 7 rebounds to help secure the win! Great job ladies! The next game is on January 15th against Evans Middle School at Evans Middle School, starting at 5:00pm. The Dowell Lionettes seventh grade basketball teams played 3 games against Willow Springs Middle School on December 6. The Blue “B” team started off losing 4-7. Olivia Bettin and Morgan Bryan each had 2 points. Olivia Bettin also had 5 steals and a block. Reyna Aguilera, Ashlee Schaar and Shelby Luther each had 3 steals. Keep working hard! The Gold “A” team lost their game 11-36. Point guard Marlee Sprott had 4 points, 3 steals and 2 blocks. Ava Slade, Ellie Pickett and Anissa Lechner each had 2 points. Post players Madison Bissa and Ashlyn Voss each had 3 steals. Ellie Pickett also had 5 blocks. Way to fight until the end! Ending the night, the White “C” team lost with a score of 7-27. High scorer of the night was Tyria Seagraves with 3 points. Madison Hall and Annika Baxter each had 2 points. Edom Kidane had 4 rebounds and Daisy Quirino had 2 steals. The next game is against Evans Middle School on January 12th at Evans, starting at 5:00pm. One Heart, One Team, LIONETTES! The 8th grade Dowell Lionettes shutout Cockrill last night with all teams getting a win! The Blue “B” team pulled out another close win with an effort by the entire team with a final score of 17-16. They all came together and played a great game. Leading scorers were Grace Boggs with 5 points and Lexi Maxfield and Bella Feruzzi each adding another 4. Great win ladies! The Gold “A” team also had another close win beating Cockrill with a score of 28-27. The girls kept their composure and fought hard to come back and win the game. High scorer was Amaya Cudgo with 13 points. Landri Maxfield and Miranda Rotunno each chipped in another 4 points. The White “C” had a dominating win with a score of 23-13. The girls played hard together and kept the momentum the entire game. Alise West was high scorer with 8 points. Kylee Brakebill added another 6 points while Cassidy Bergenthal contributed 4. Awesome teamwork girls! The next game is on January 8th against Willow Springs Middle School at McKinney Boyd, starting at 5:00pm. The Dowell Lionettes seventh grade basketball teams played 3 great games against Cockrill Middle School on December 15. The Blue “B” team started off with a close game, but unfortunately losing 14-20. The high scorer of the game was Olivia Bettin with 4 points. Kelsey Unger had 4 steals and 3 rebounds. Morgan Bryan had 3 rebounds and 2 points. You’ll get them next time, ladies! The Gold “A” team lost a close, exciting game with a score of 17-19. Point guard Marlee Sprott had 12 points and 5 steals. Post player Trinity Dudek had 7 steals, and Ashlyn Voss had 5 blocks and 5 rebounds. Way to fight until the end, ladies! Ending the night, the White “C” team lost with a score of 14-22. Kyrah Hendrix and Madison Hall were the high scorers of the evening with 4 points each. Daisy Quirino had 6 steals, and Racheal Readus had 5 steals. Nice job playing a solid second half! The next game is against Willow Springs Middle School on January 6th at Dowell, starting at 5:00pm. One Heart, One Team, LIONETTES! The 8th grade Dowell Lionettes had their first home game of the season last night against Scott Johnson. All three teams came out victorious! The Blue “B” team had an exciting win beating Johnson 17-10. High scorer of the game was JJ Coleman with 5 points. Coleman also contributed 4 rebounds. Grace Boggs added another 4 points and 6 steals! Great way to fight for the win girls! The Gold “A” team also had an exciting win against Johnson! The lionettes won a close battle in overtime with a final score of 19-16. High scorer was Amaya Cudgo with 10 points and 5 rebounds. Landri Maxfield and Kionce Woods both added another 3 points each. The girls never gave up and fought hard to get the win! Great job girls. The White “C” had another big win with a score of 23-12. The team came out on fire and could not be stopped. Audrey Lane, Alise West, and Kylee Brakebill all contributed 4 points each. Danielle Johnson had 4 big rebounds to help seal the victory. Awesome job girls! Way to work together as a team and keep up the awesome work. The next game is against Cockrill Middle School on December 18th at Dowell, starting at 5:00pm. The Dowell Lionettes seventh grade basketball teams played 3 great games against Johnson Middle School on December 8. The Blue “B” team started off the night wonderfully, winning 29-16. Post player Morgan Bryan was the high scorer of the night with 13 points and 9 rebounds. Olivia Bettin had 4 points and 4 steals, and Bailey Walerczyk had 4 points and 4 rebounds. Way to go to the entire team for a job well done! The Gold “A” team lost their game 14-30. Marlee Sprott had 8 points and 3 rebounds. Post player Ashlyn Voss had 4 points and 13 rebounds. Trinity Dudek had 4 steals and Madison Bissa had 4 rebounds. Great job to the everyone for working hard! Ending the night, the White “C” team won an exciting game with a score of 25-4. Rachel Beason had 6 points and 9 steals throughout the game. Edom Kidane had 7 points and 6 rebounds. Kaitlyn Ward, Madison Hall and Camryn Ciancia each had 4 points. The entire team had 40 collective steals during the game! Way to go ladies! The next game is against Cockrill Middle School on December 15th at Dowell, starting at 5:00pm. One Heart, One Team, LIONETTES! The 8th grade Dowell Lionettes fought out 3 exciting games in prosper on December 4th, 2014. All 3 teams came out with a victory in their season opener. The Blue “B” team had an exciting win beating Prosper 17-16. High scorer of the game was Grace Boggs with 8 points, and 6 steals. JJ Coleman had 5 points and 4 rebounds. As a team, Dowell had 22 steals throughout the game. Great win girls! The Gold “A” team also had an exciting victory beating Prosper in overtime! The Lionettes won 36-30 not allowing the other team to score any points during overtime. High scorers were Amaya Cudgo with 13 points and 6 rebounds. Kionce Woods added 8 points along with 4 rebounds. It was an entire team effort. Great job girls! Ending the night, the White “C” had a big win with a score of 18-7. Symmone James and Alise West both contributed 6 points and a combined 13 rebounds. Kylee Brakebill, Cassidy Bergenthal, and Audrey Lane all added 2 points each to help seal the victory. Awesome job! The next game is against Johnson Middle School on December 11th at Dowell, starting at 5:00pm. One Heart, One Team, LIONETTES! The Dowell Lionettes seventh grade basketball teams played 3 hard-fought games against Prosper on December 2. The Blue “B” team lost 4-24 at the beginning of the night. Ashlee Schaar and Olivia Bettin had 2 points each. Kelsey Unger and Morgan Bryan had 3 rebounds each. Keep working hard! The Gold “A” team lost their game 15-34. Post player Ashlyn Voss was the high scorer of the game with 6 points and 3 rebounds. Ellie Pickett had 4 blocks, 2 rebounds and 2 points. Marlee Sprott had 2 points from free throws on the line and 2 steals. Way to go! Ending the night, the White “C” team lost 4-9. Tyria Seagraves and Annika Baxter each had 2 points. Chloe Becker had 9 steals and 2 rebounds. Rachel Beason had 5 steals and a rebound. Awesome job! The next game is against Johnson Middle School on December 8th at Dowell, starting at 5:00pm. One Heart, One Team, LIONETTES!